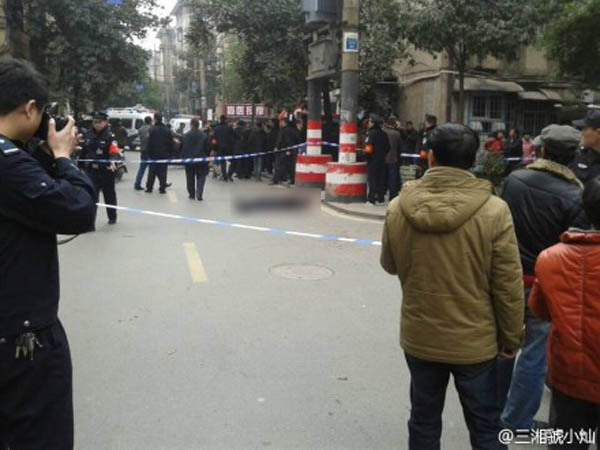 BEIJING - Knife-wielding assailants attacked civilians on a street in the central Chinese city of Changsha on Friday morning, state news agency Xinhua said, citing local authorities. 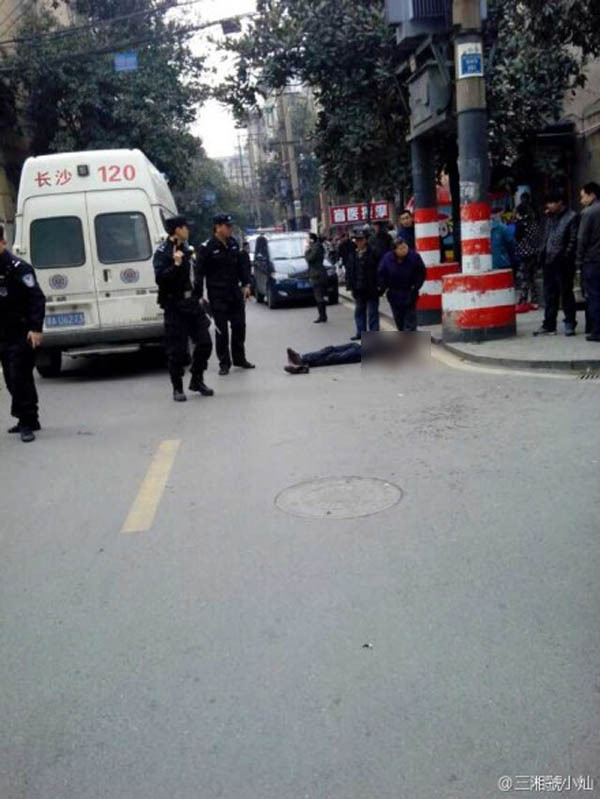 Xinhua said its reporters saw at least one body lying on the ground at the scene. 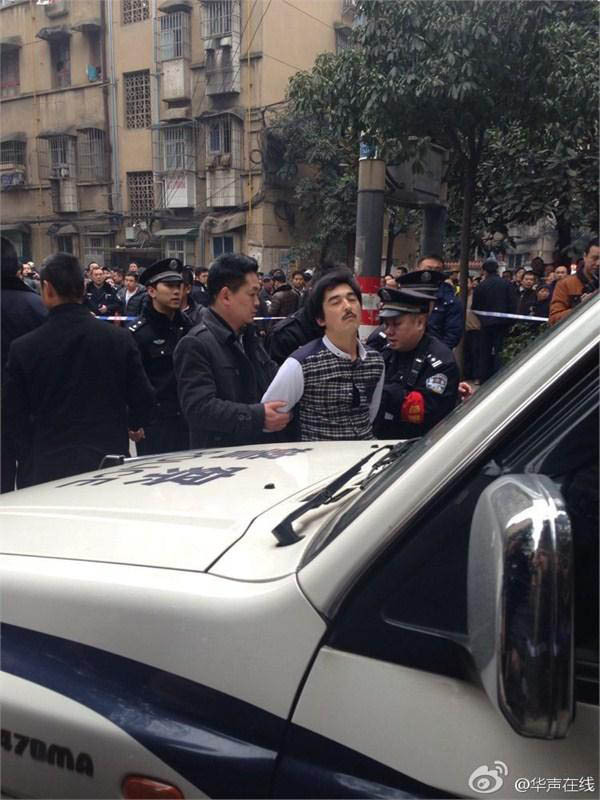 Photos on microblogs showed at least four bodies on a street outside a school and police taking a suspect into custody. 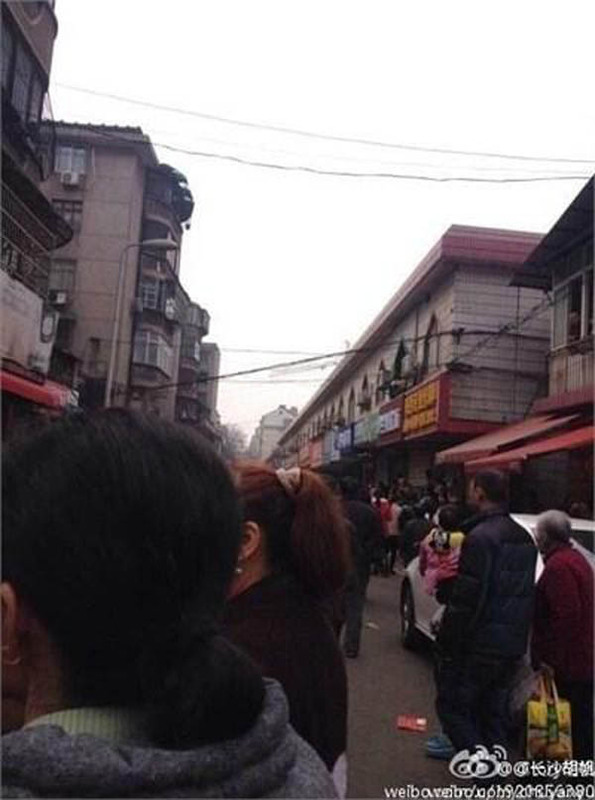 The authenticity of the photos could not be immediately confirmed. 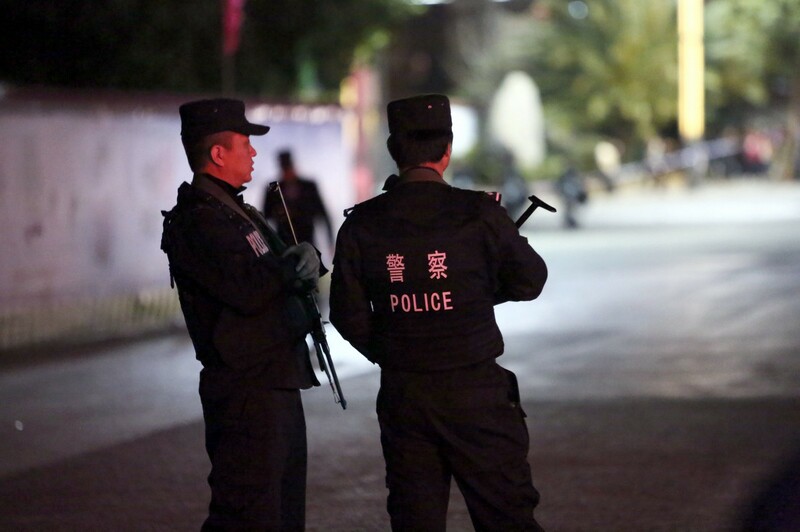 Xinhua did not make clear who was responsible for the attack in the city, capital of Hunan province. 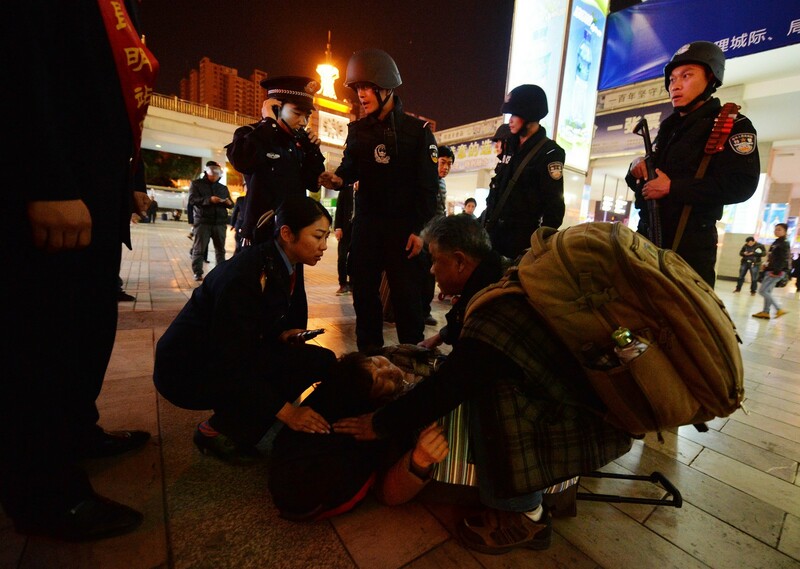 The incident happened just two weeks after a deadly stabbing attack at a Chinese train station in the southwestern city of Kunming which killed 29 people and injured about 140. 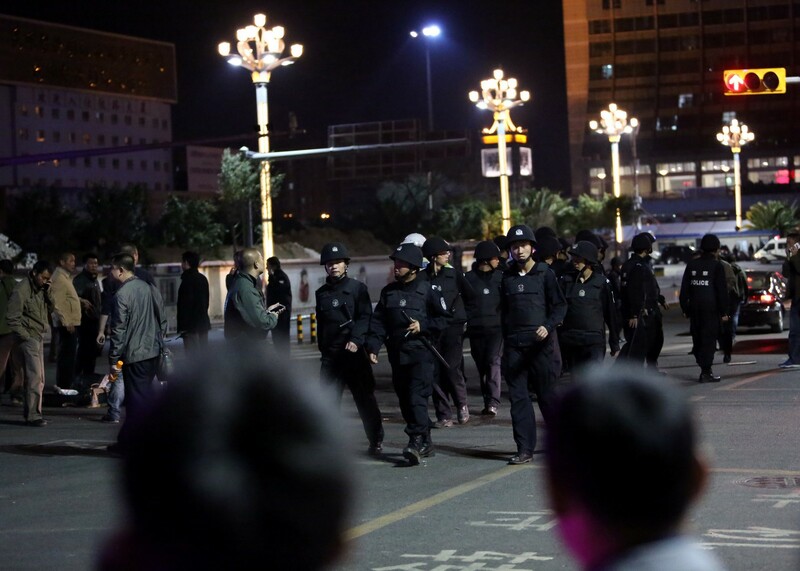 The government blamed that attack on militants from the western region of Xinjiang, home to a large Muslim Uighur minority. 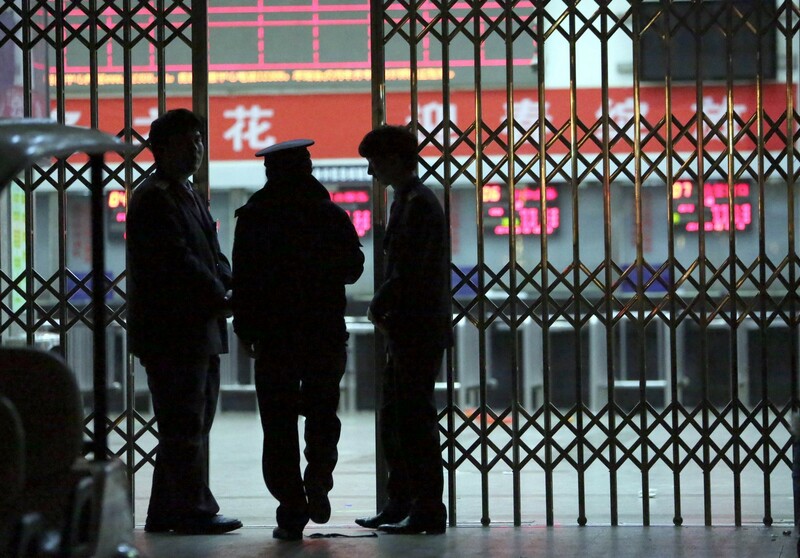 Many Uighurs say they are infuriated by Chinese curbs on their culture and religion, though the government says they are given wide freedoms. 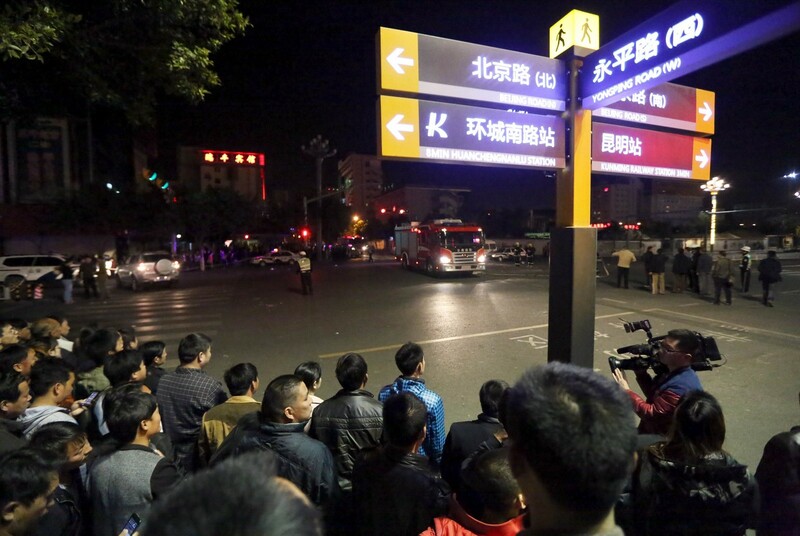 Attackers armed with knives killed at least three people in central China Friday, an official said, ruling out a terrorist incident two weeks after a mass stabbing left 29 people dead and stunned the nation. 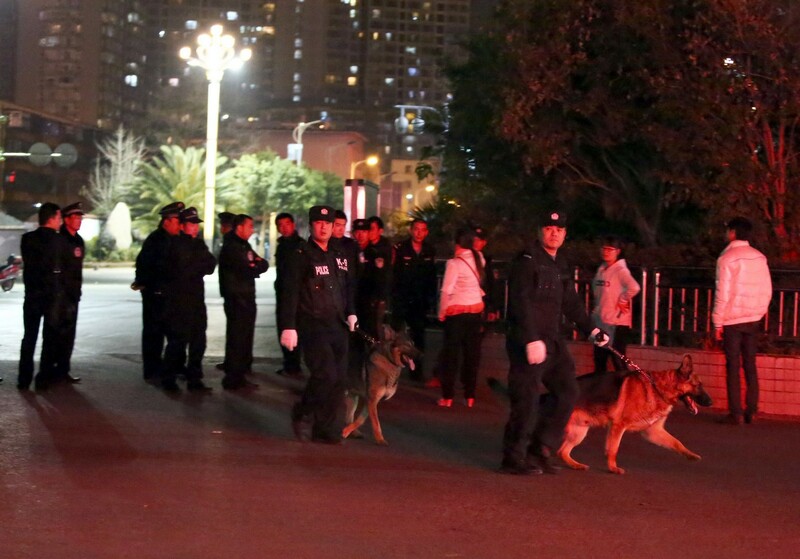 "Three people died," an official in Changsha, the capital of Hunan province, told AFP by phone. 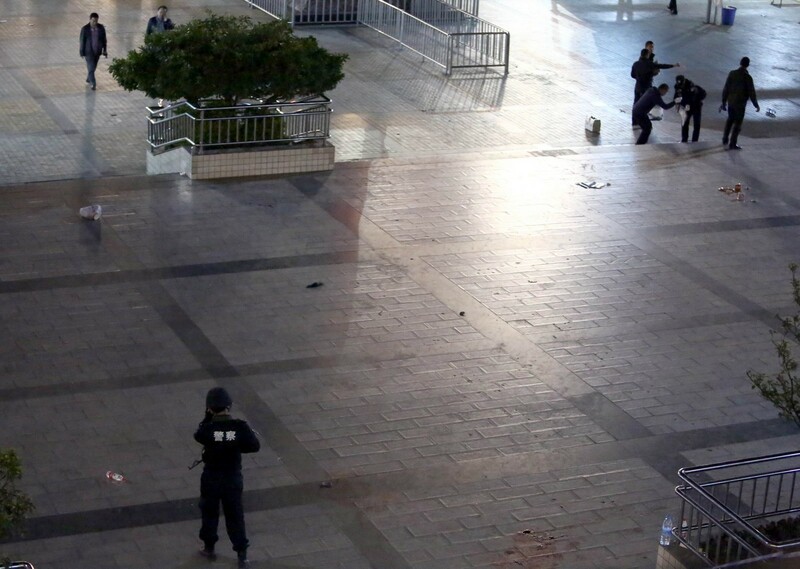 "I can assure you it's not a terror attack. 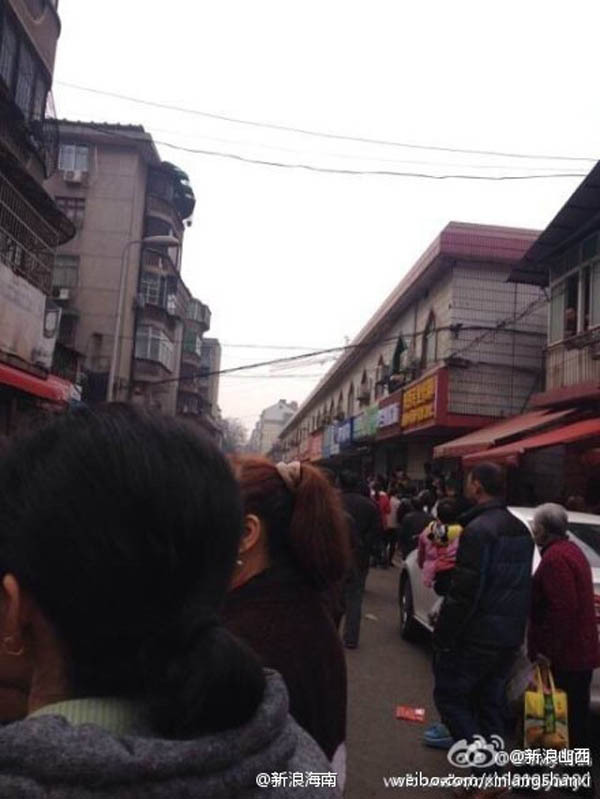 It happened in a market due to some dispute." 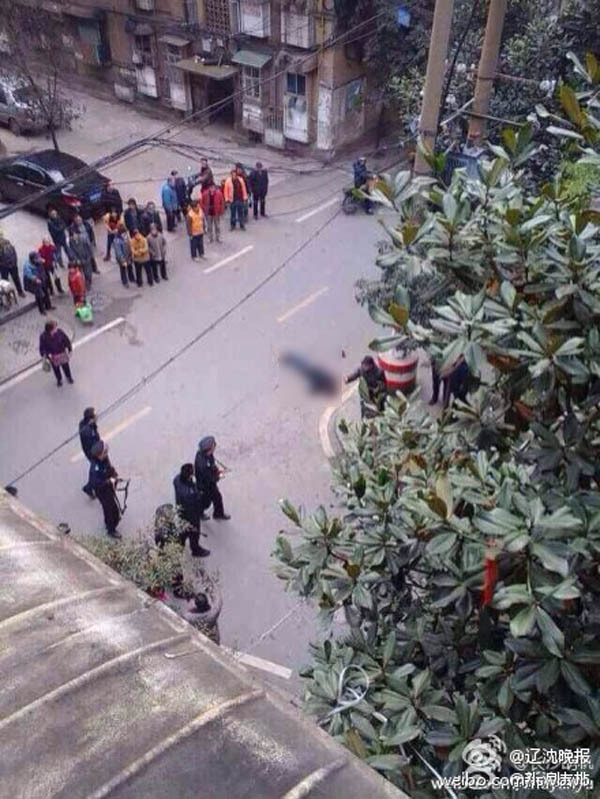 The official news agency Xinhua reported that "a group of knife-wielding assailants attacked civilians" and left "three bodies lying on the ground". 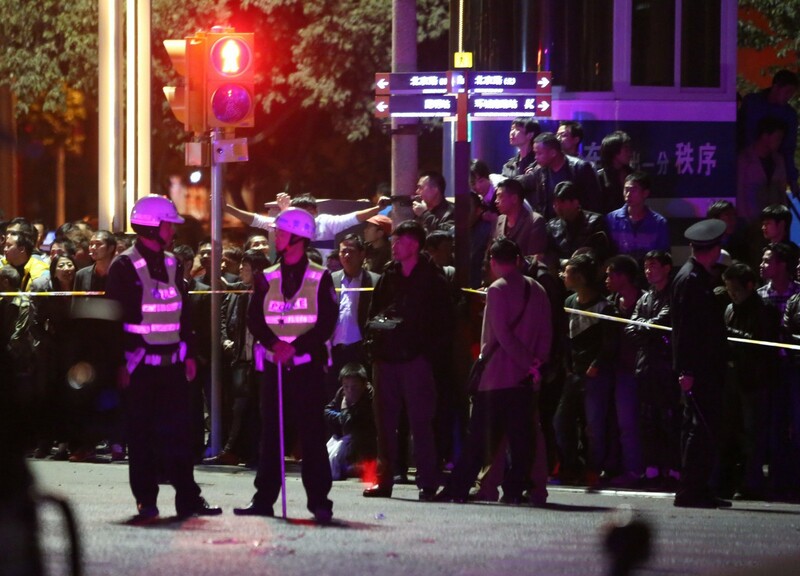 Police and ambulances had arrived and the area had been cordoned off, it added. 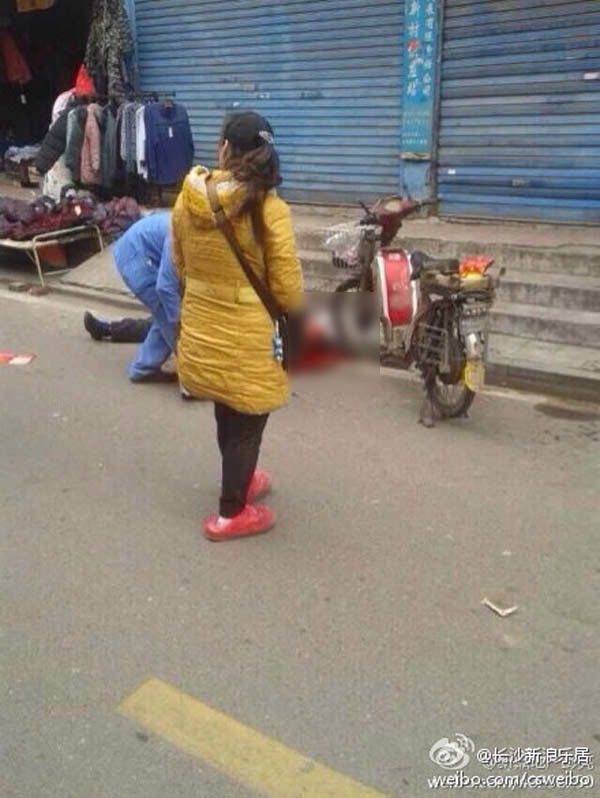 A Hunan radio station described one attacker, who ran a bakery, as having a dispute and then stabbing to death a woman in her 80s who had just walked out onto the street. 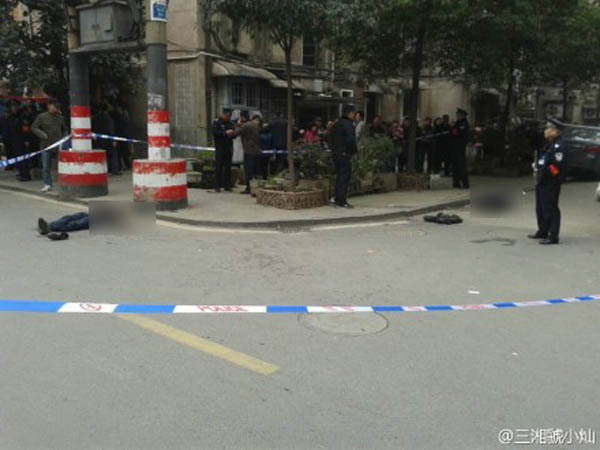 Three people had been killed and one injured, it said on its account of Sina Weibo, a Chinese version of Twitter, citing police. 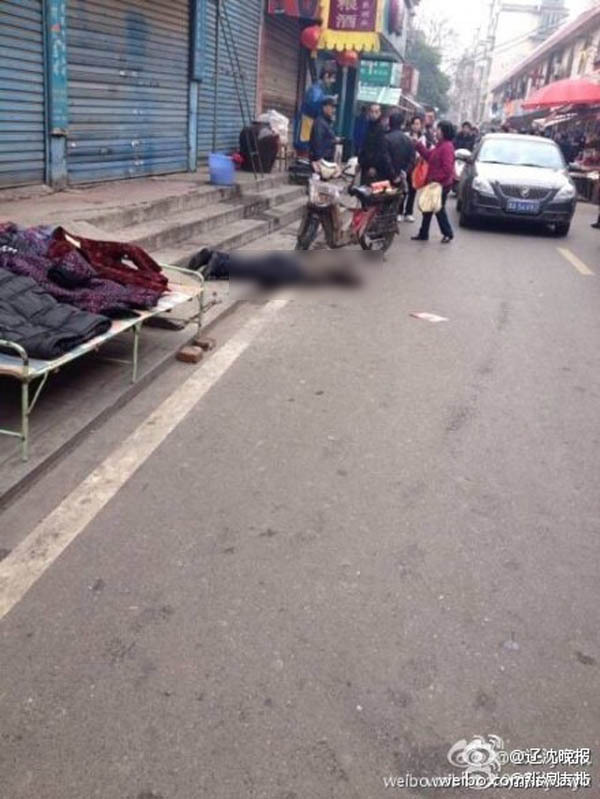 The Hunan Daily newspaper said, citing an eyewitness, that one male had a dispute with another, attacked him with a kitchen knife, and then ran after other people until altogether "five passersby were stabbed". 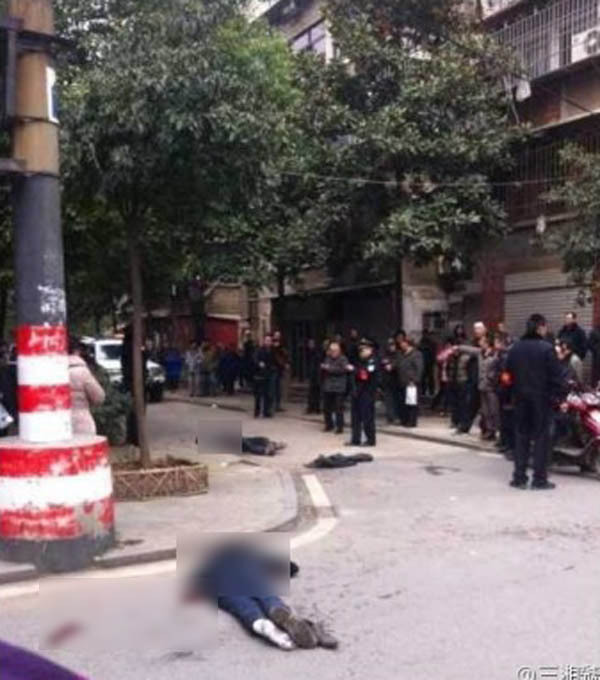 Photos posted online - whose authenticity could not be verified - appeared to show the bloodied bodies of three men lying on the ground, with armed police and bystanders nearby. 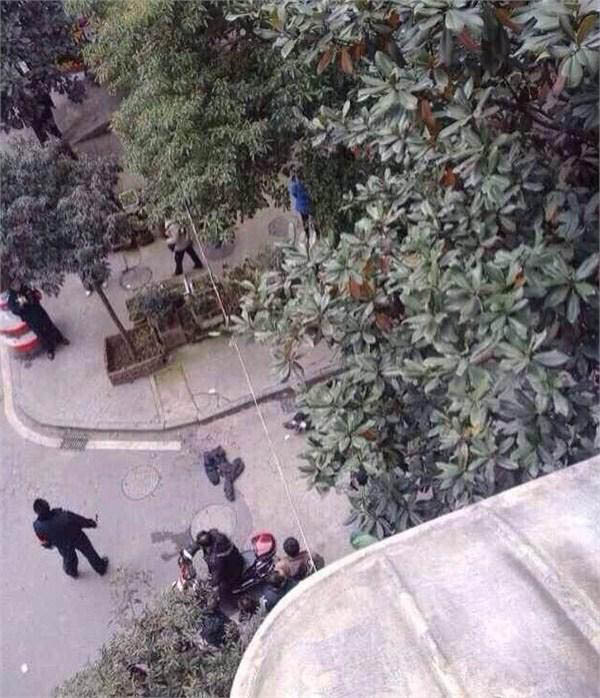 Another showed a man being taken away by officers. 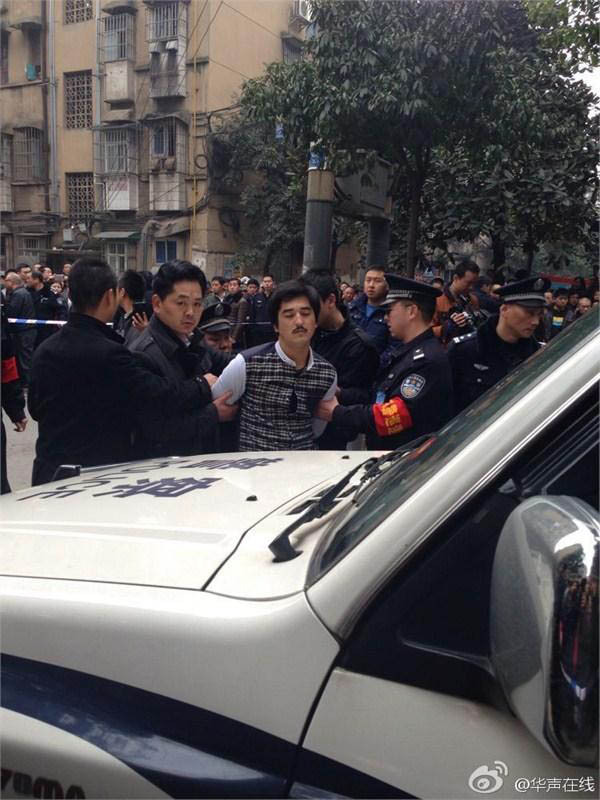 Internet users quoted by news services said one attacker had been shot dead by police. 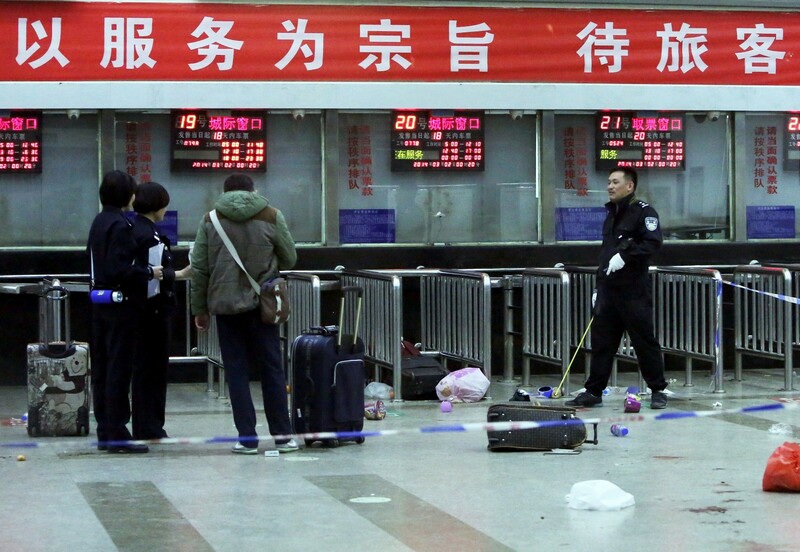 A mass stabbing at a Chinese train station late on March 1 left 28 people dead and 113 injured in a "violent terrorist attack", state media said. 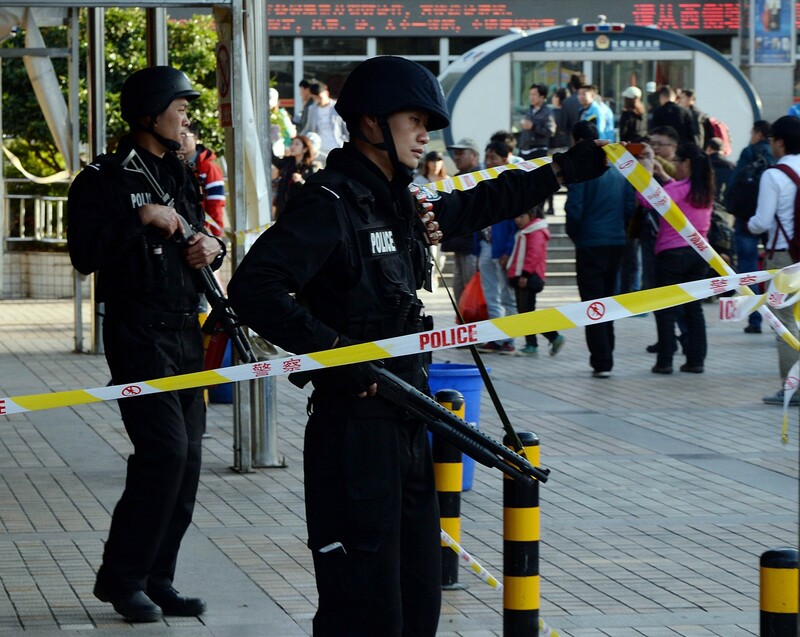 Chinese police investigators inspect the scene of an attack at the railway station in Kunming, southwest China's Yunnan province. 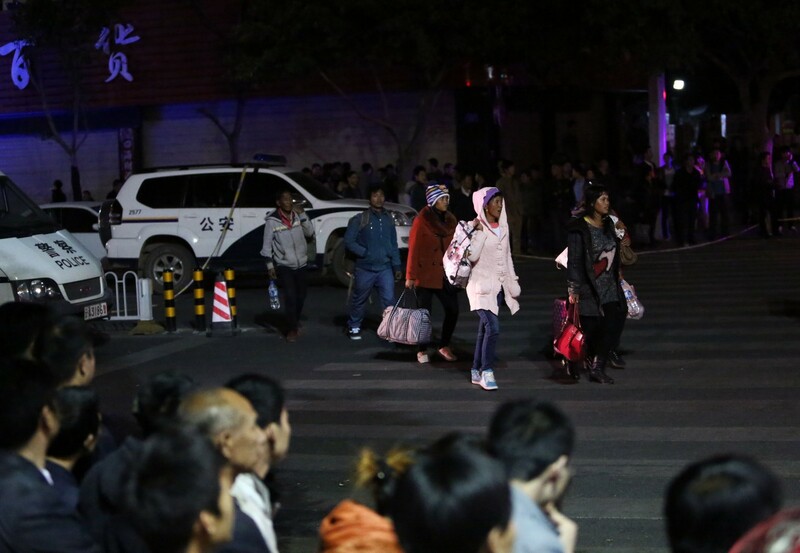 Another 109 people were injured, the report added. 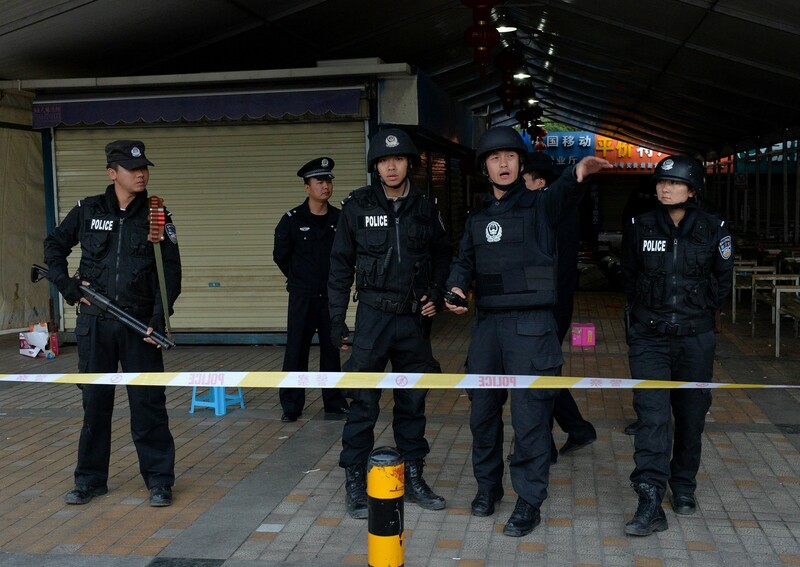 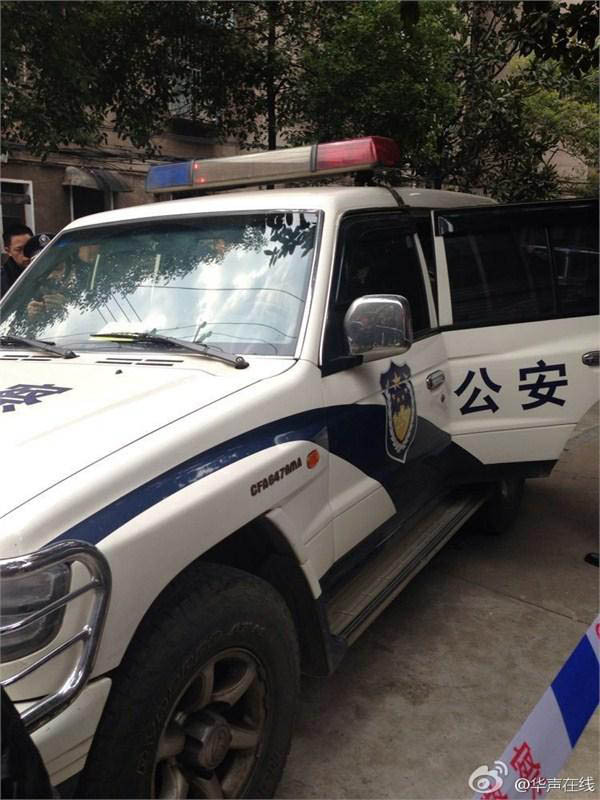 Separatists from China's northwest region of Xinjiang orchestrated the attack, the Xinhua news agency reported on Sunday. 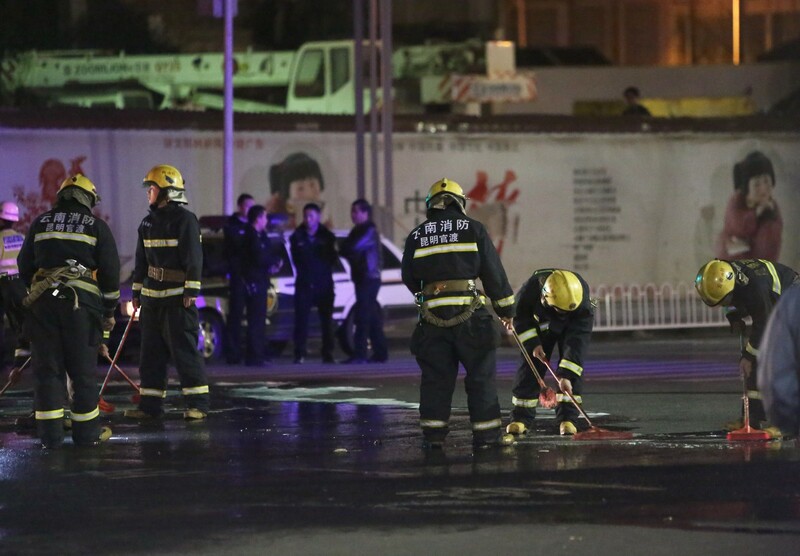 It said evidence from the scene of the attack late Saturday by a group of knife-wielding people pointed to separatists from Xinjiang. 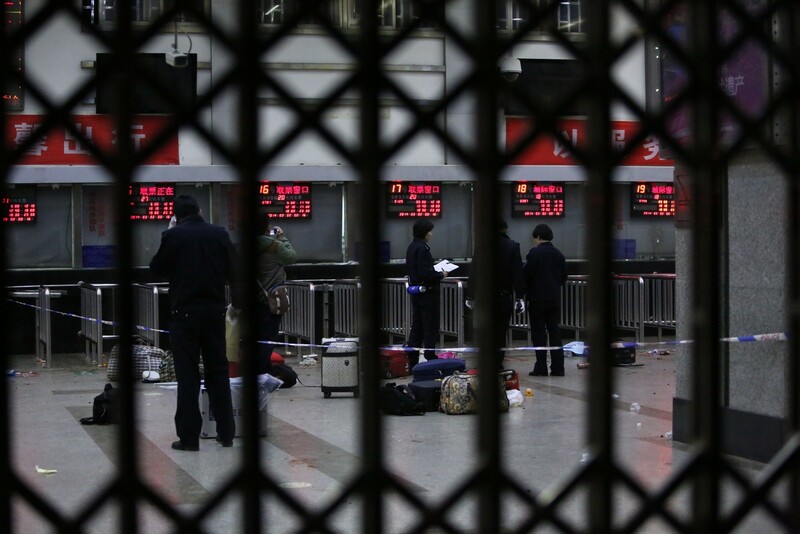 Victims described attackers dressed in black bursting into the station and slashing indiscriminately. 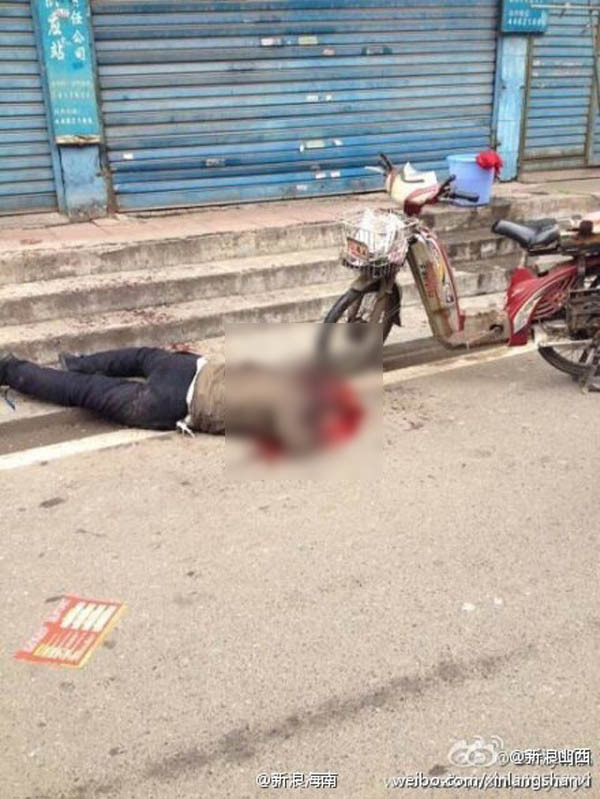 Police shot dead at least four attackers. 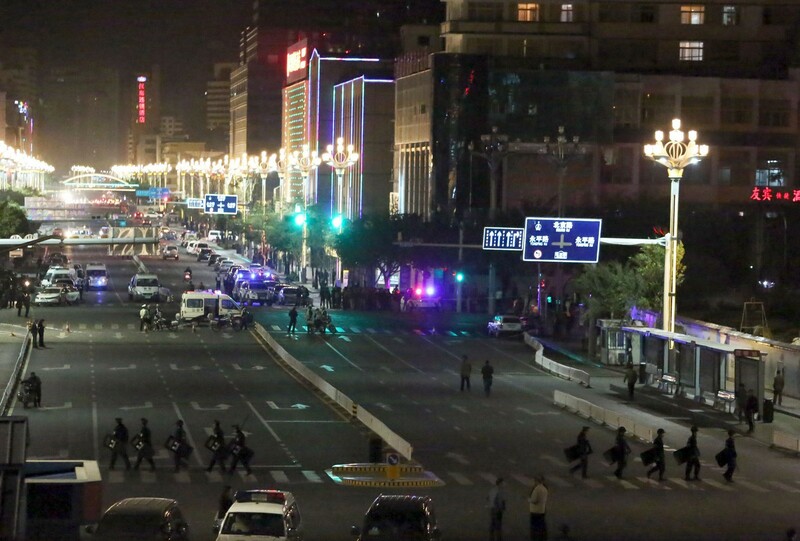 Xinjiang is periodically hit by violent clashes between locals and security forces but such attacks are rare elsewhere in China. 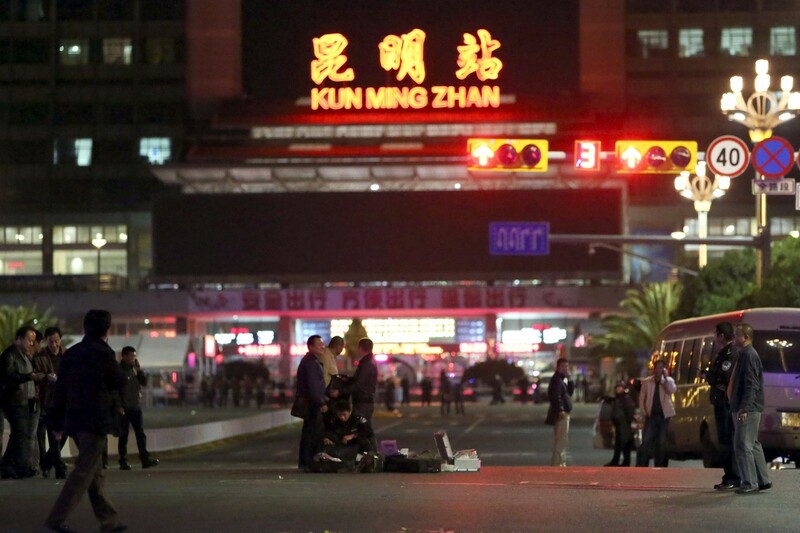 Police patrol on a street after a group of armed men attacked people at Kunming railway station. 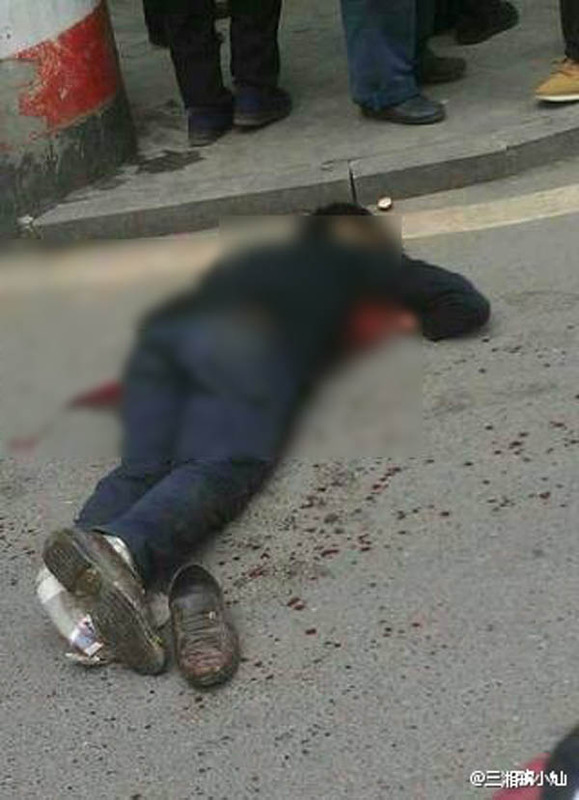 A policeman stands guard near a man who was shot dead by police. 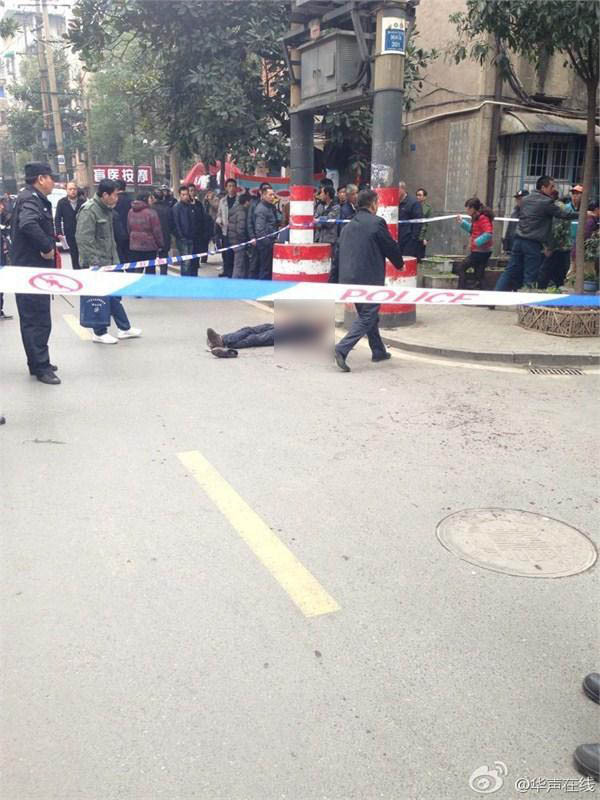 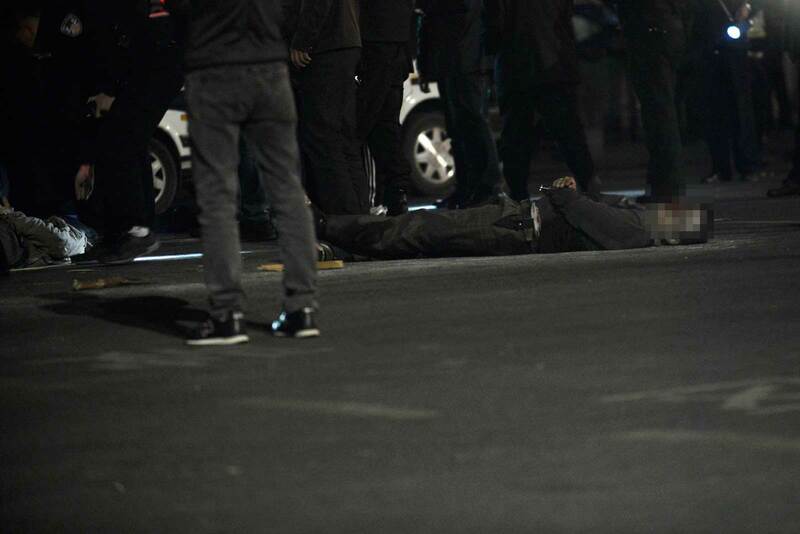 A man, who was shot dead by police, lies on a street after a group of armed men attacked people at Kunming railway station. 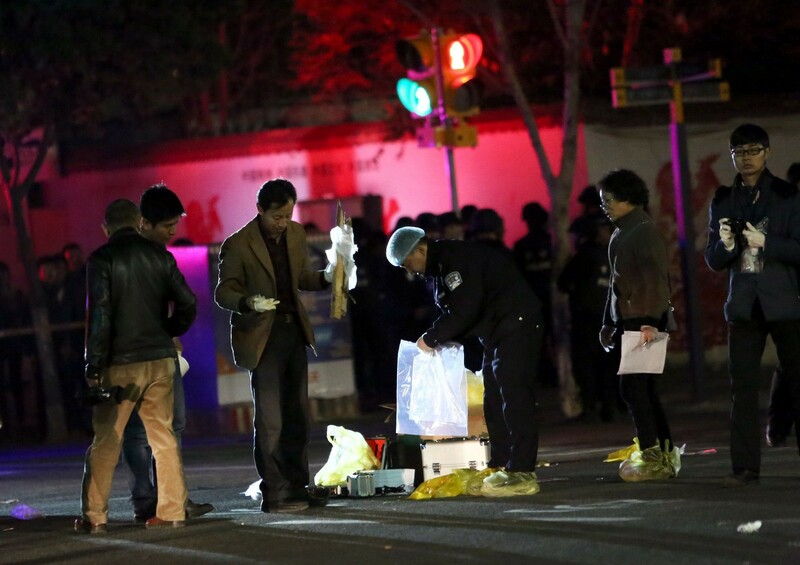 Police investigators inspect the scene after the attack. 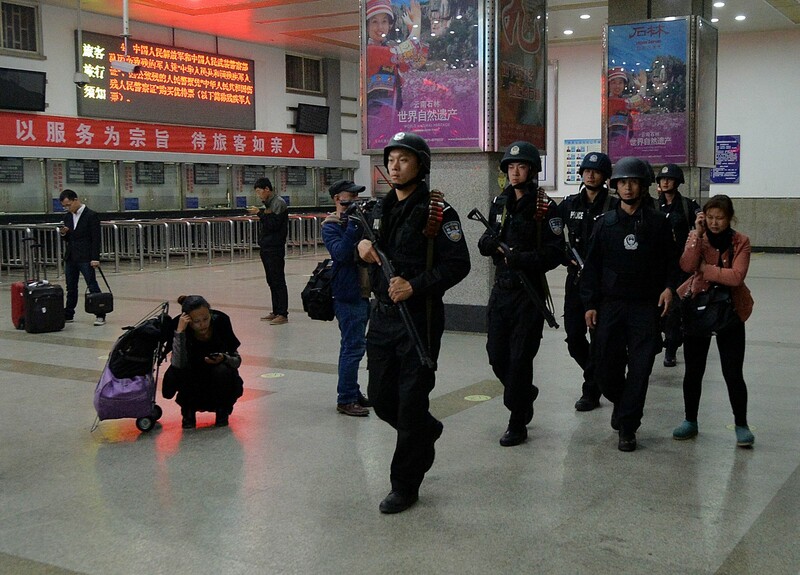 Separatists from China's northwest region of Xinjiang orchestrated the attack on a train station which left 29 dead, the Xinhua news agency reported. 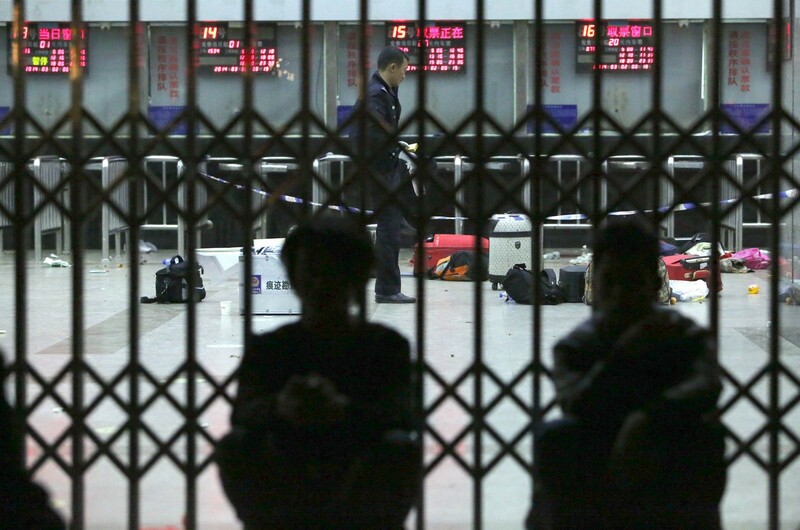 Shoes are seen on the ground at the scene inside the Kunming railway station. 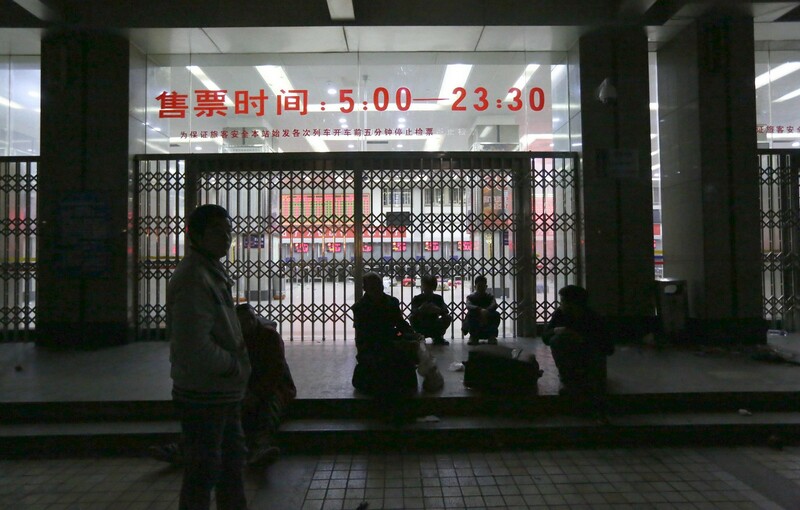 People wait outside the closed gate of the Kunming railway station. 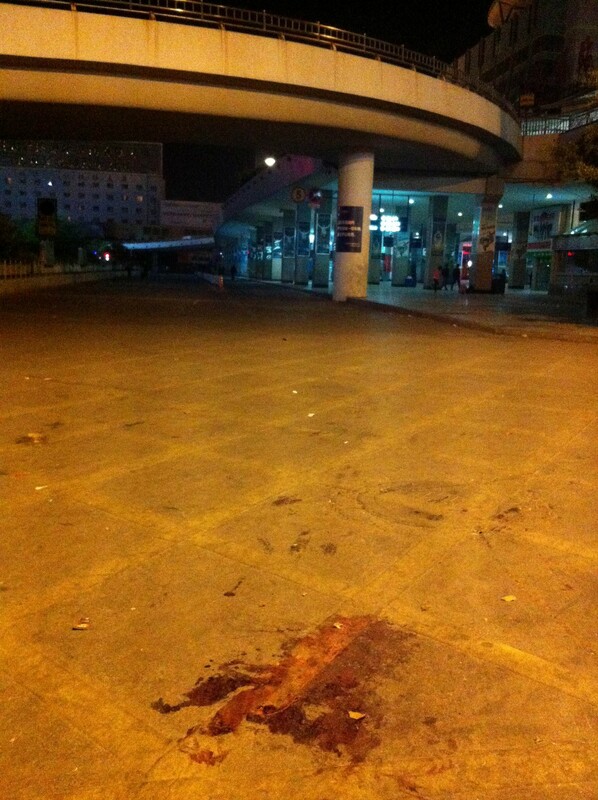 Blood stains are seen on the square of the Kunming railway station. 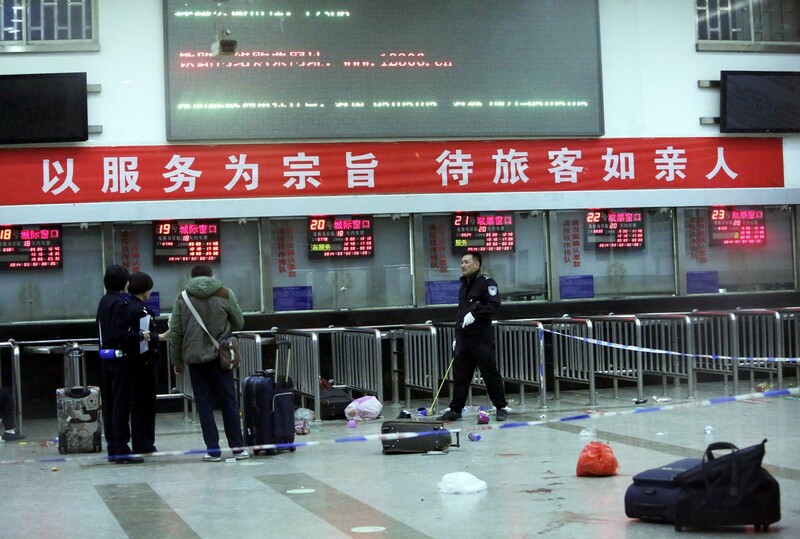 A knife victim named Yang Haifei, who was wounded in the chest and back, told Xinhua that he had been buying a train ticket when the attackers approached. 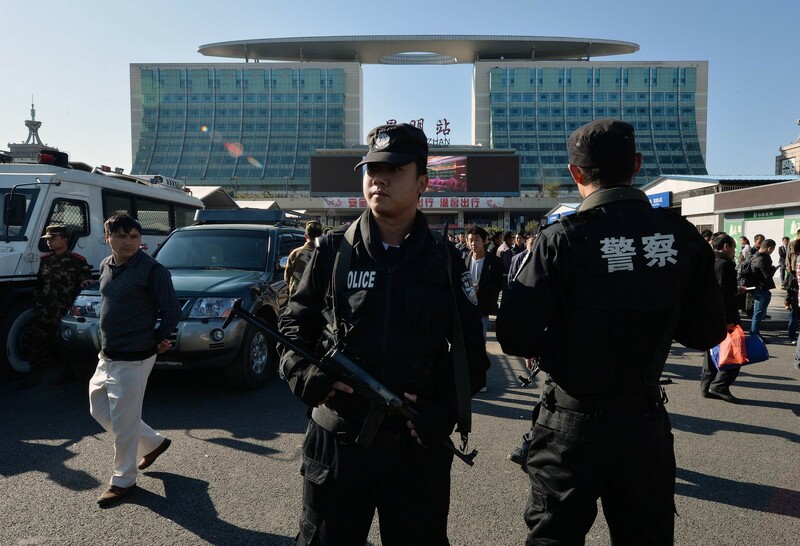 The attack comes months after three members of the same family from Xinjiang crashed their car into crowds of tourists in Tiananmen Square in Beijing. 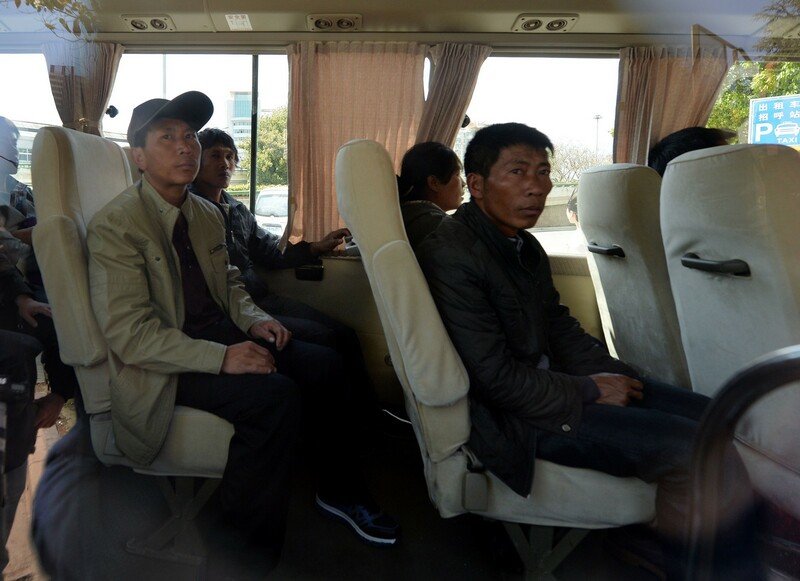 Some who managed to escape were desperately looking for missing loved ones. 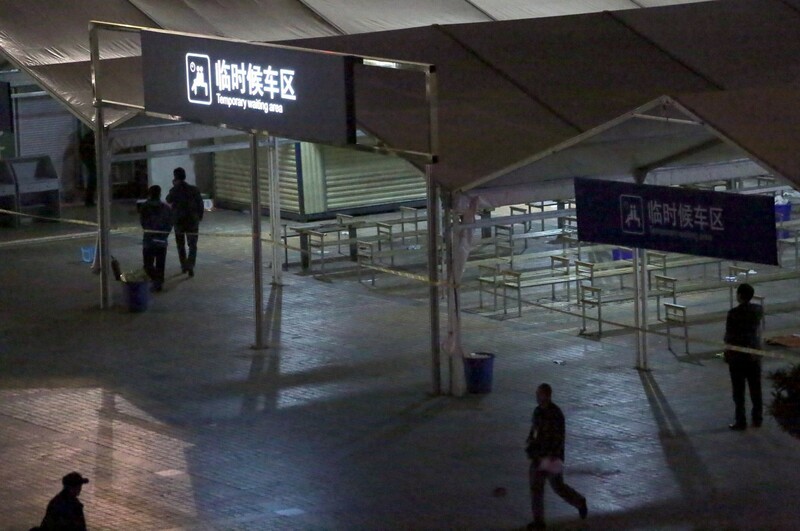 Officers sealed off a wide area around the station, reports said, while police were questioning people at the site. 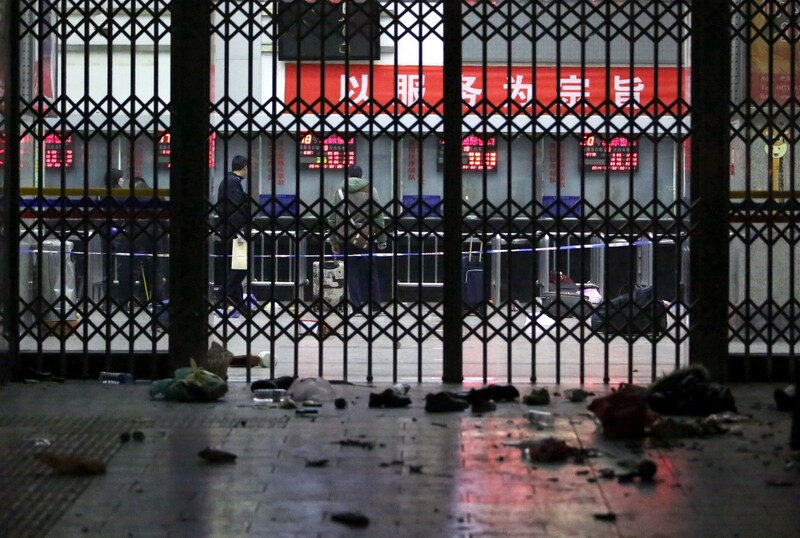 "A group of men carrying weapons burst into the train station plaza and the ticket hall, stabbing whoever they saw," said China News Service. 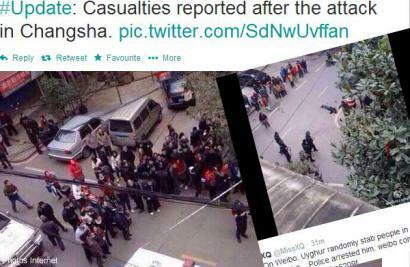 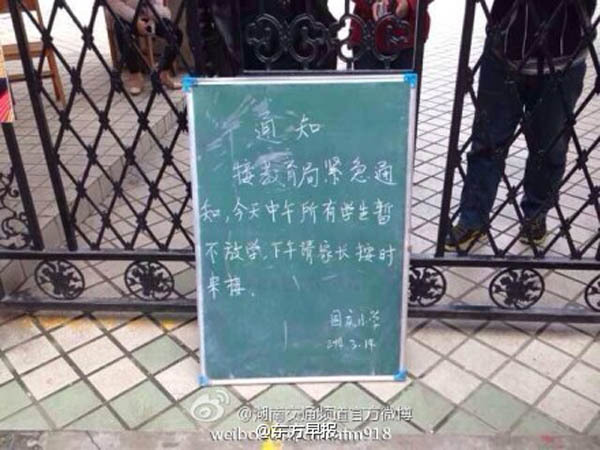 State broadcaster CCTV called the incident a "terrorist attack" on its Weibo account. 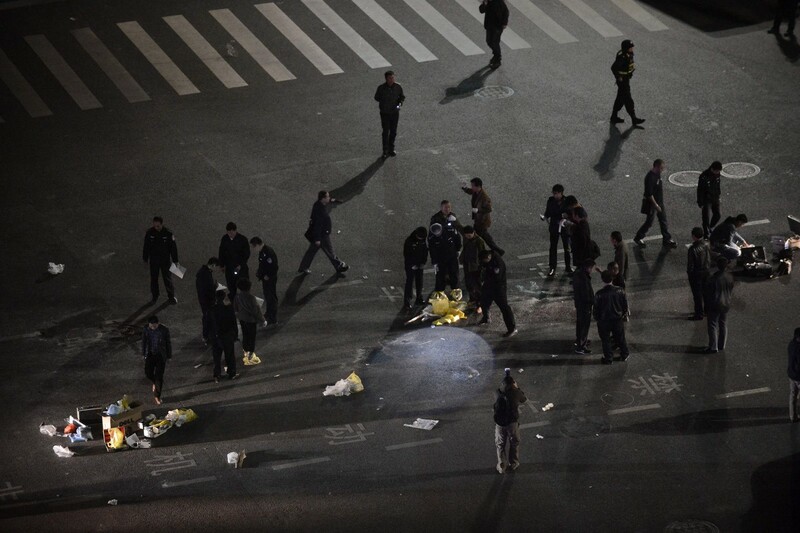 President Xi Jinping called for "all-out efforts" in the investigation and for the attackers to be punished "in accordance with the law", Xinhua said. 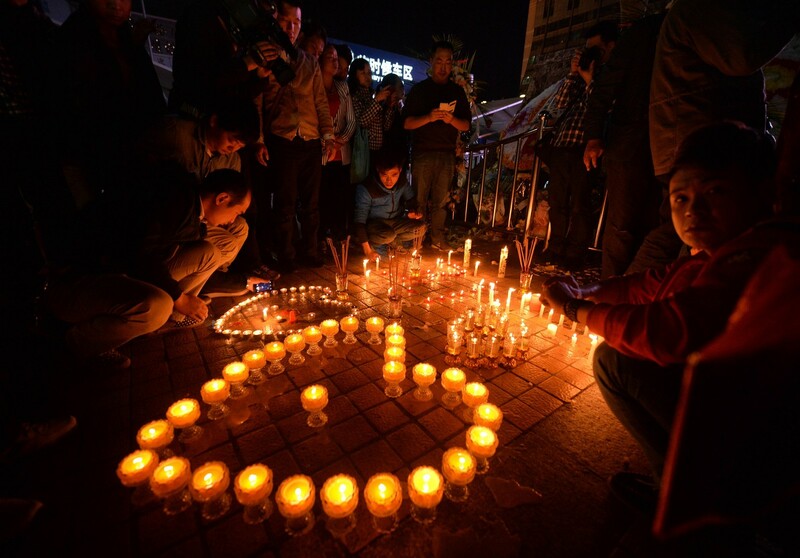 Xi and Premier Li Keqiang sent condolences to the victims and their families. 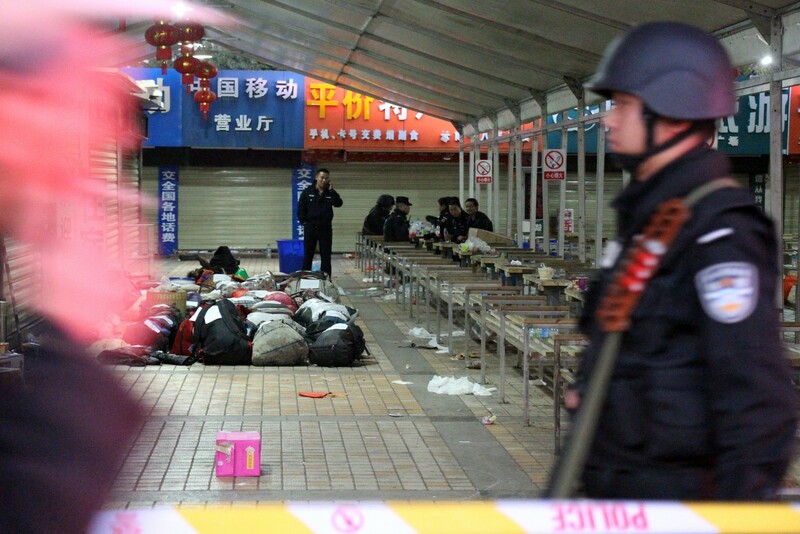 Photos posted on Sina Weibo showed blood spattered across the station floor and medical staff crouching over bodies lying on the ground, although the authenticity of the images could not be verified. 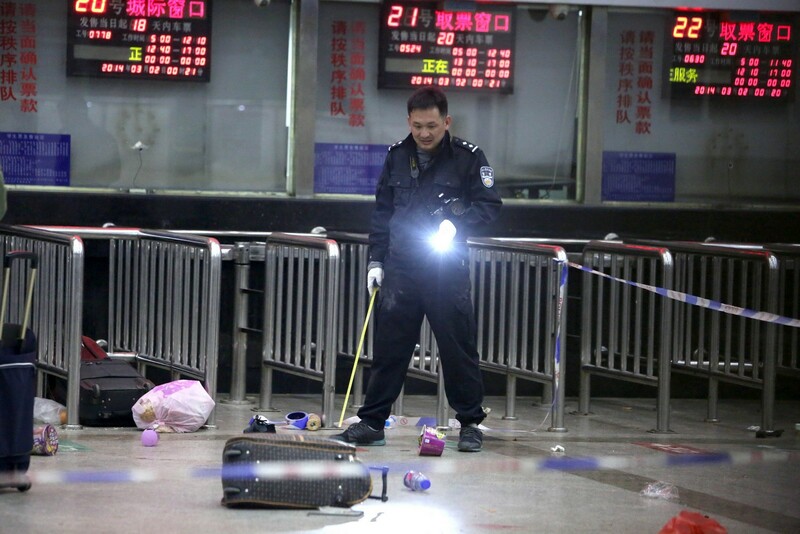 Images of spectacles, shoes and baggage strewn across the floor of the waiting room behind police tape, were also posted online. 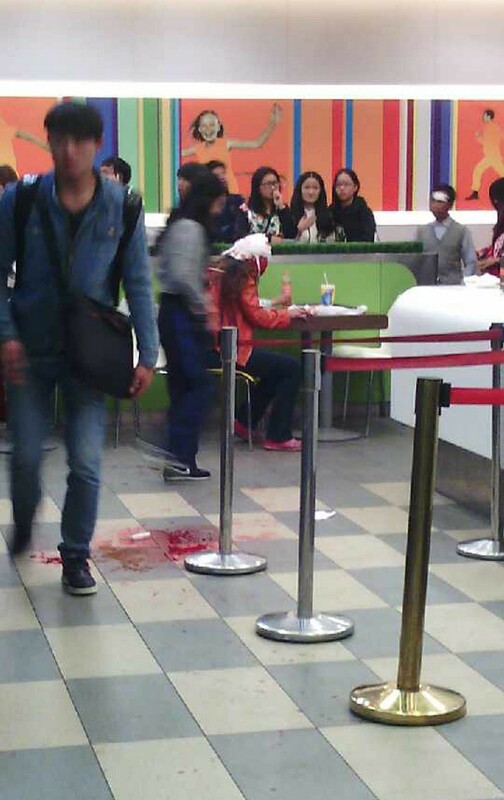 This cellphone photo taken on March 2, 2014 shows an injured woman (C) sitting in a restaurant in the Kunming railway station after the attack. 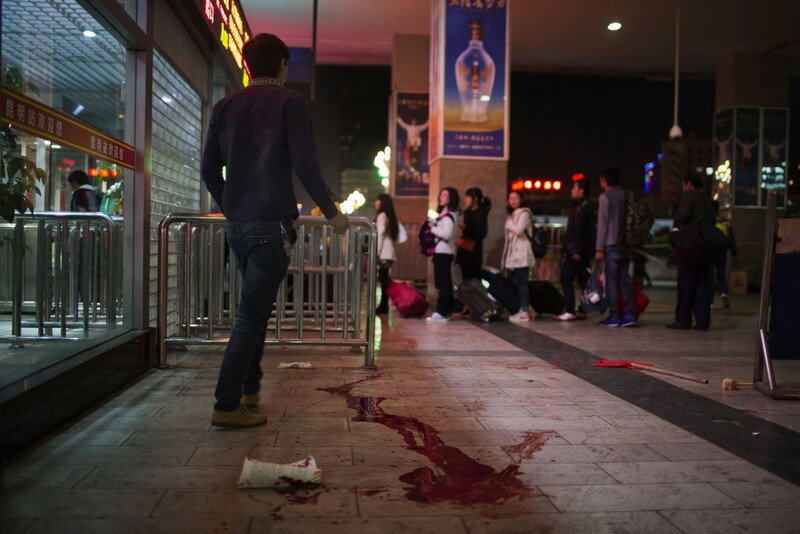 Blood is seen on the ground outside after a knife attack at Kunming railway station. 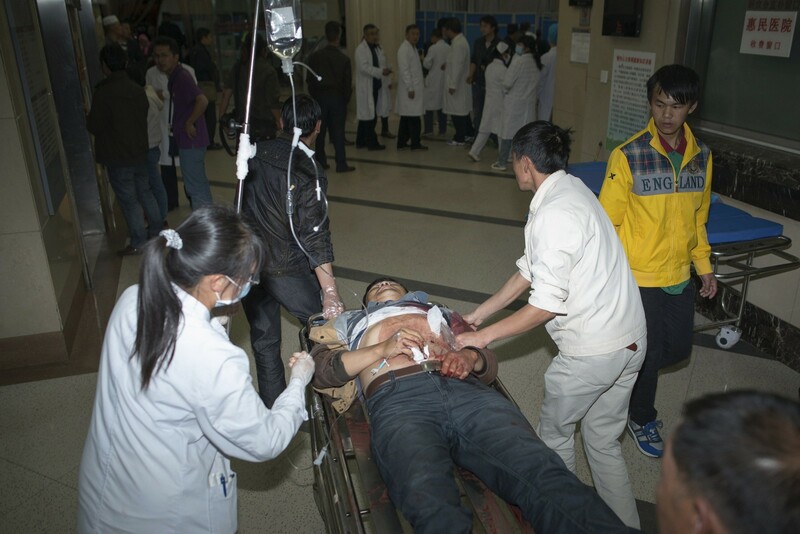 An injured man is pushed on a gurney at a hospital after the knife attack. 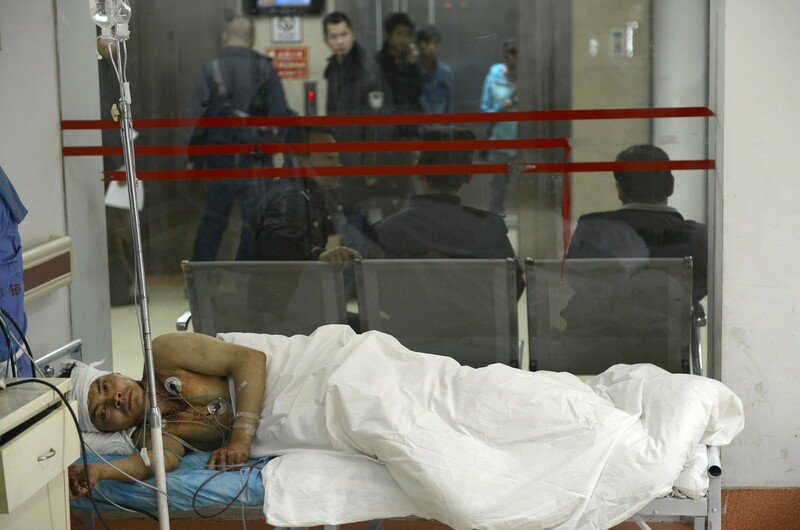 An injured man is seen lying in a hospital bed. 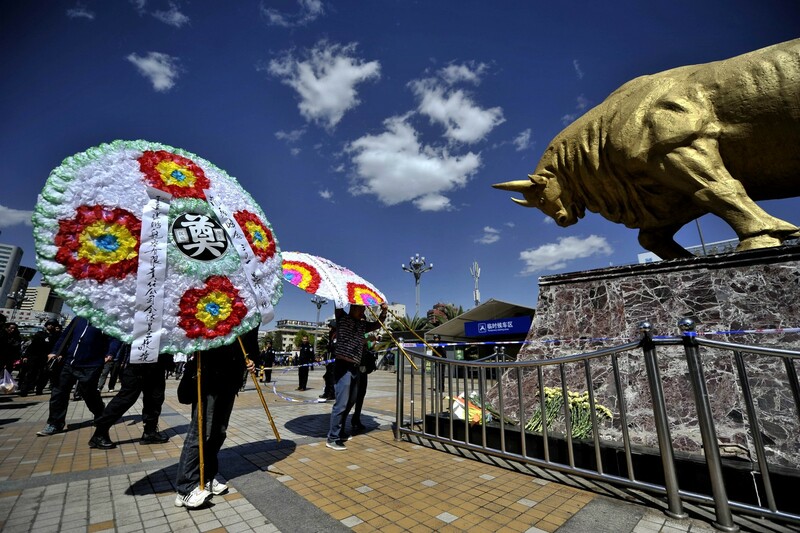 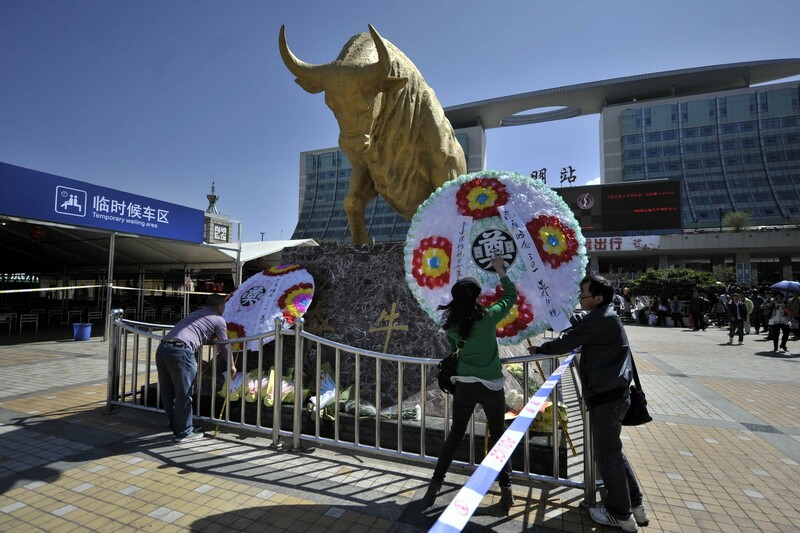 People gather to lay a wreath by a statue of an Ox on a square outside the railway station in Kunming. 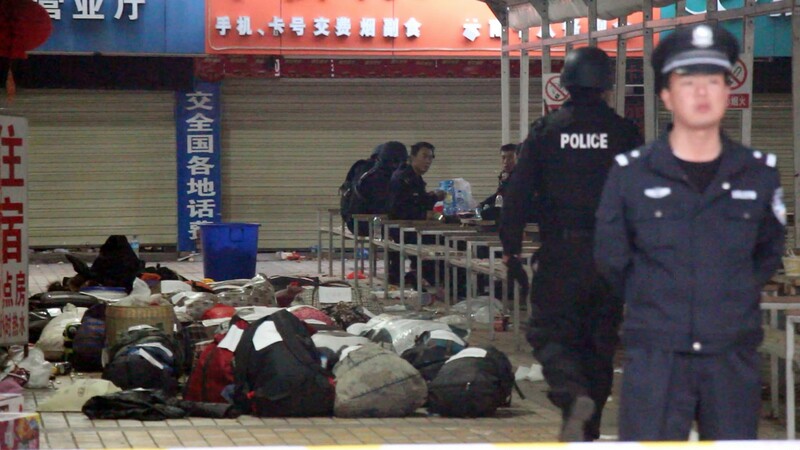 A group of eight wielding large knives killed 29 people and injured more than 140 at Kunming Railway Station. 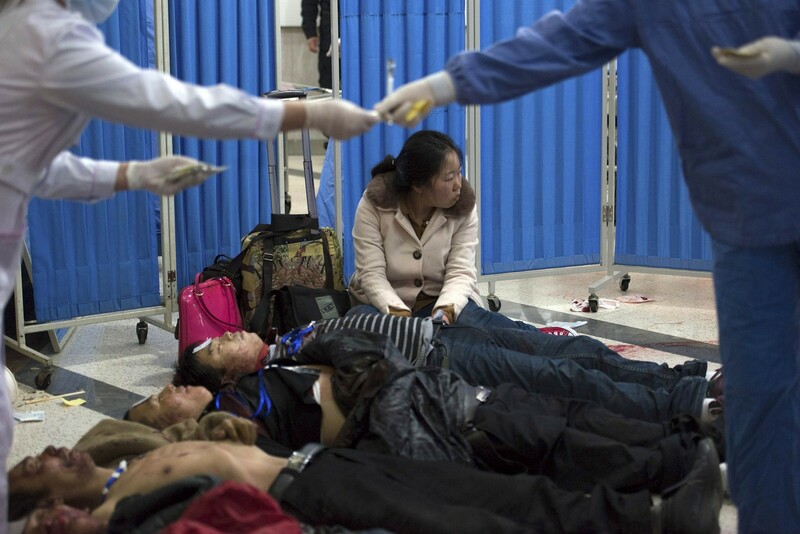 Bodies of victims lie on the floor at a hospital. 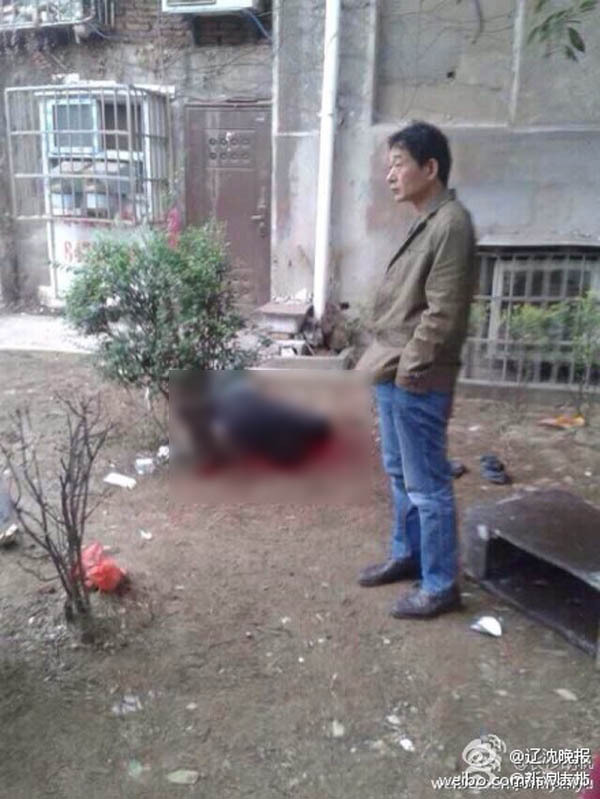 Travel agency owner Chen Yugui, 50, witnessed the fatal shooting of four knife wielding attackers. 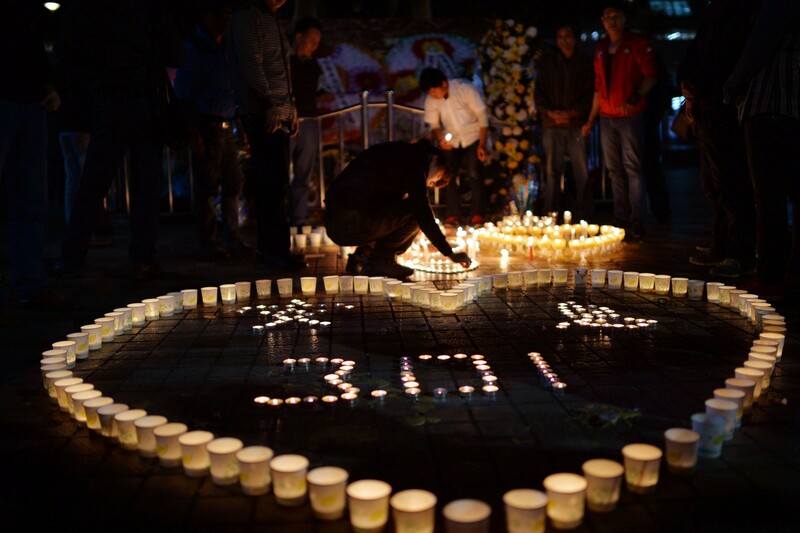 Chinese mourners light candles at the scene of the terror attack. 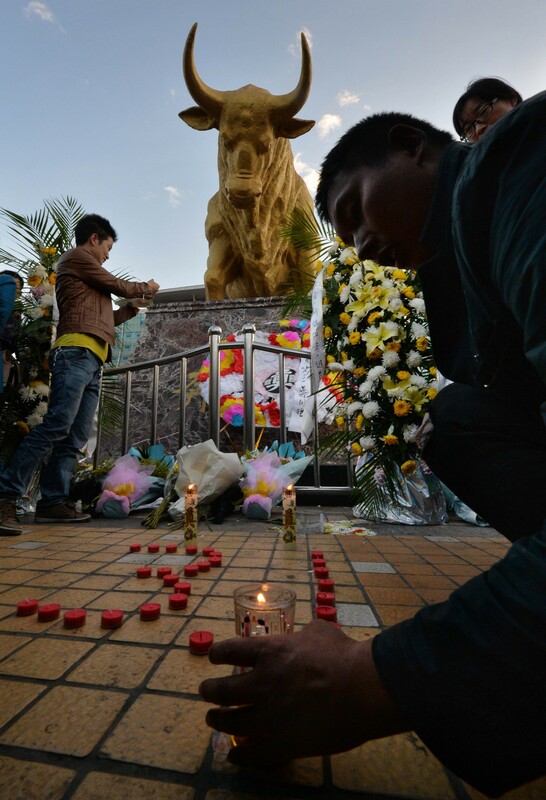 People gather to lay a wreath by a statue of an Ox on a square outside the railway station. 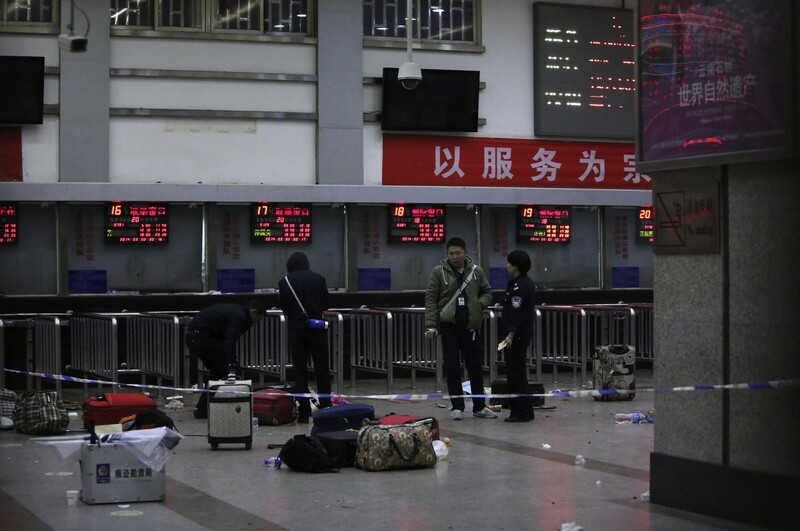 Chinese police walk past abandoned luggage at the scene of the attack. 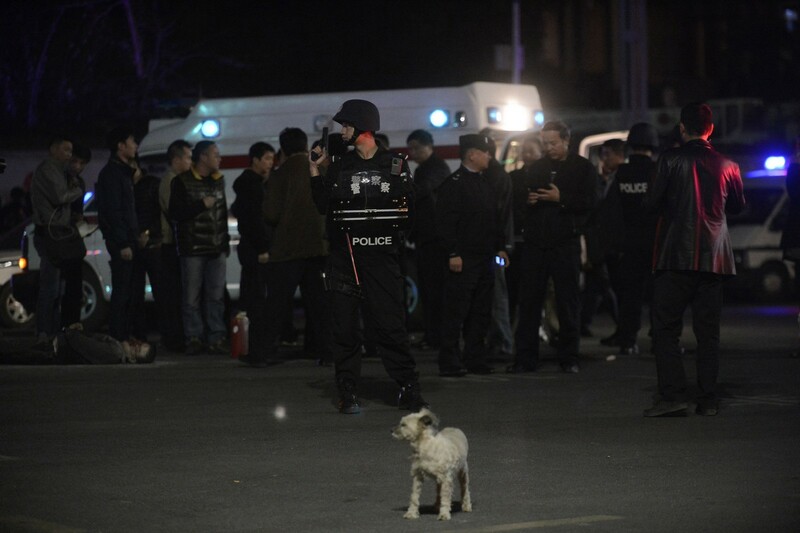 Chinese police stand guard at the scene of the attack. 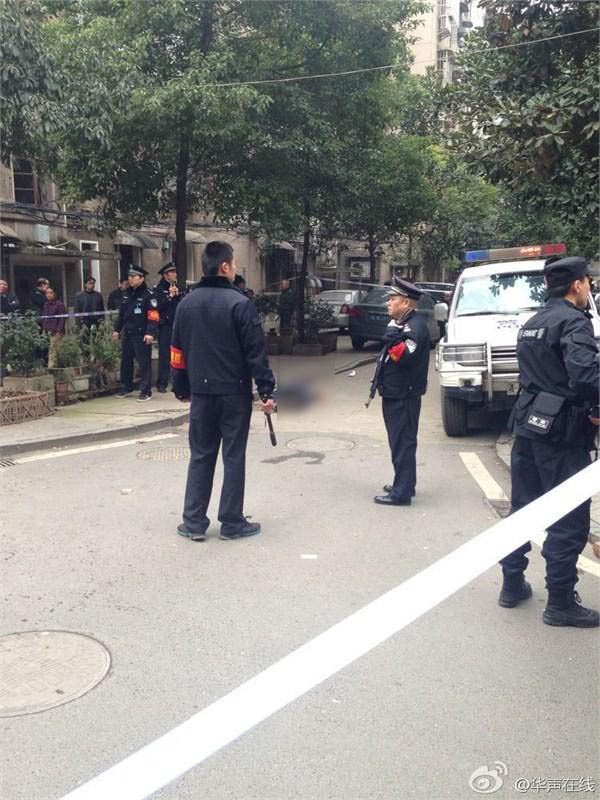 Chinese armed police patrol the scene of the terror attack. 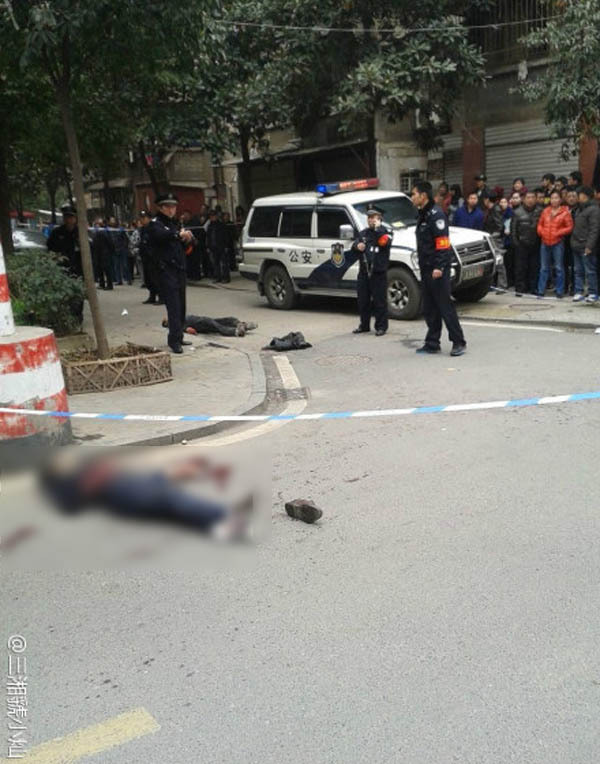 Four attackers were shot dead by police at the time of the attack and a wounded woman was captured at the scene. 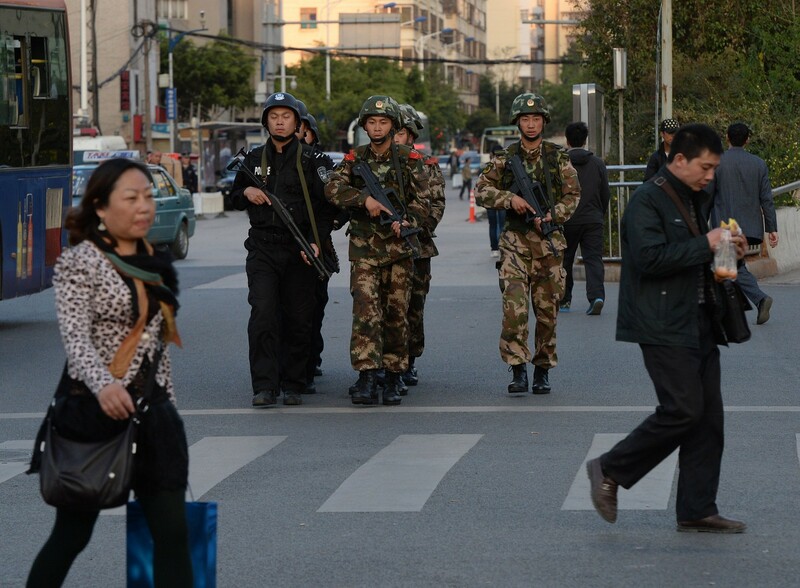 China has blamed separatists from its restive far-western region of Xinjiang. 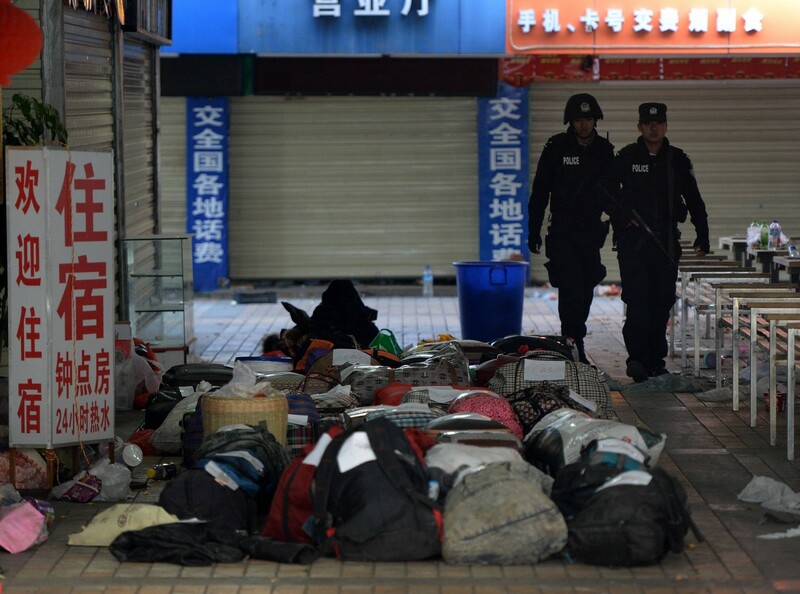 Altogether eight members of a "terrorist gang" carried out the stabbing spree late Saturday. 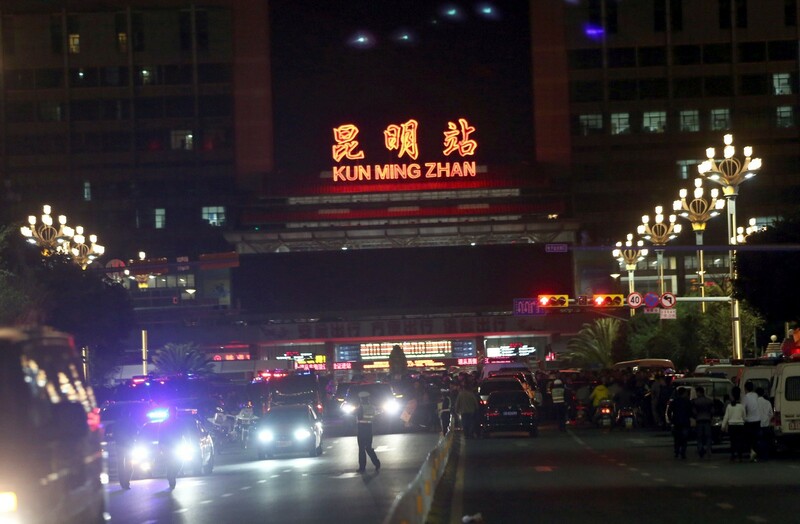 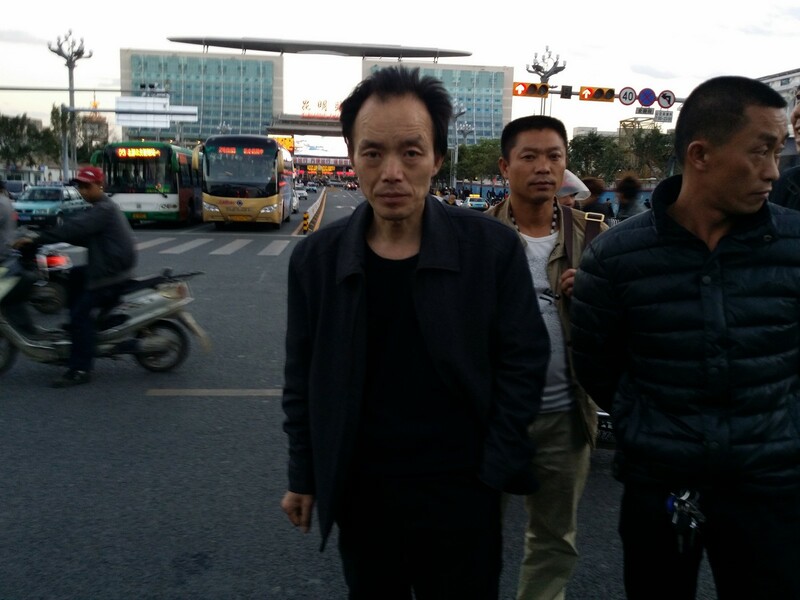 In Kunming a taxi driver said she would stay away from the train station where the violence occurred, underscoring the tense sense of fear in the southwestern city. 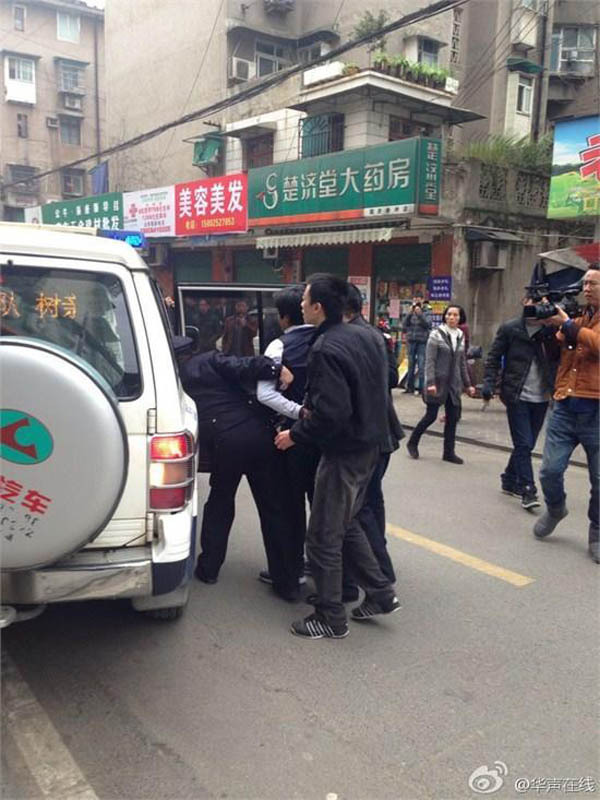 Chinese armed police and officials help a sick woman who was at the scene of the attack. 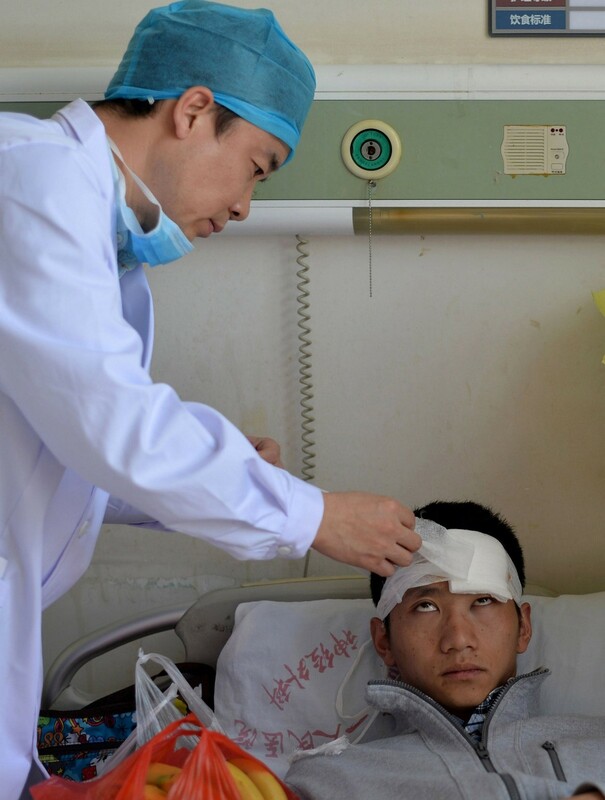 A doctor checks an injured victim in a hospital chamber in Kunming No. 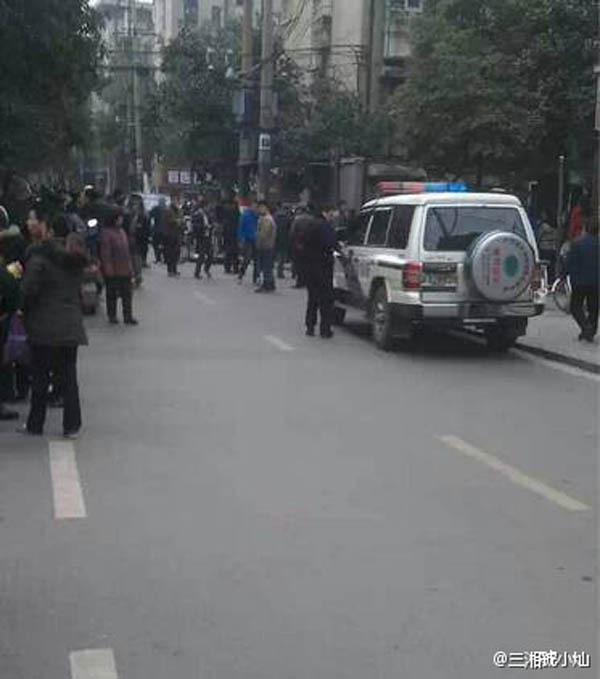 1 People's Hospital. 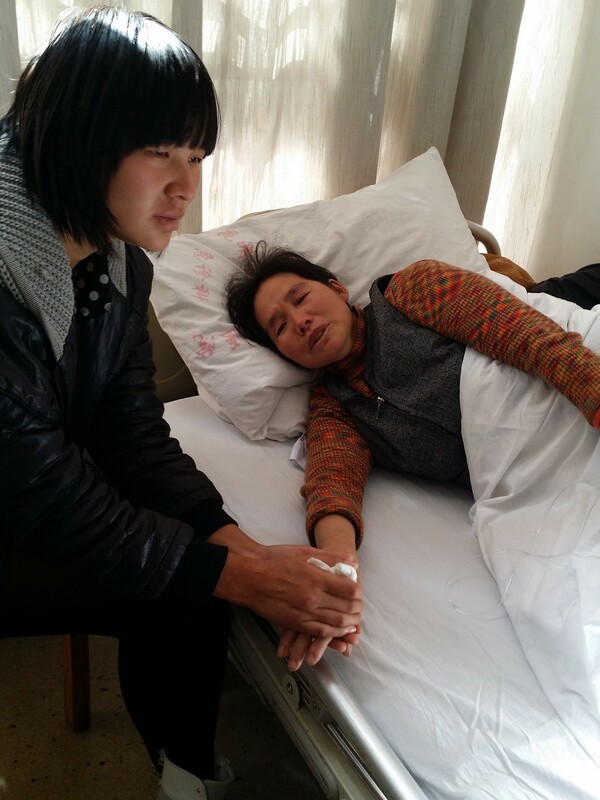 Madam Chen Guizhen, 50, (seen here with her niece in hospital) survived the terror attack at Kunming Railway Station, but her husband Xiong Wengong, 59, was not as lucky. 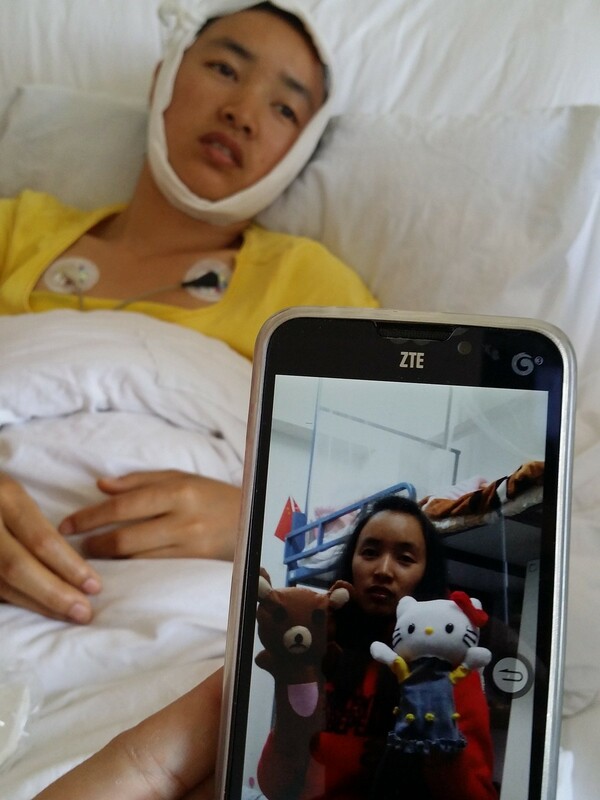 Kunming student Chen Ruilin, 23, suffered a hack at her forehead when the attackers stormed the ticket officer area where she and four other friends were. 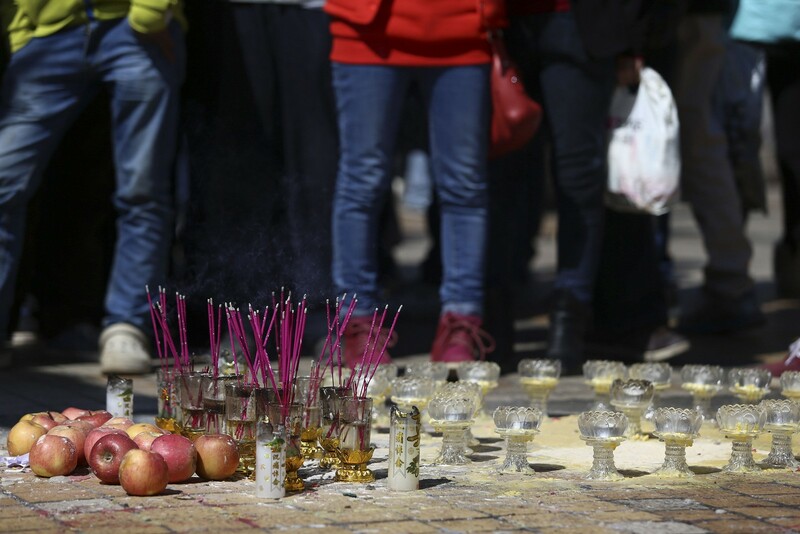 Apples, burning incenses and candle holders are seen on the floor as people pay tributes to the victims of a knife attack at Kunming railway station in Kunming. 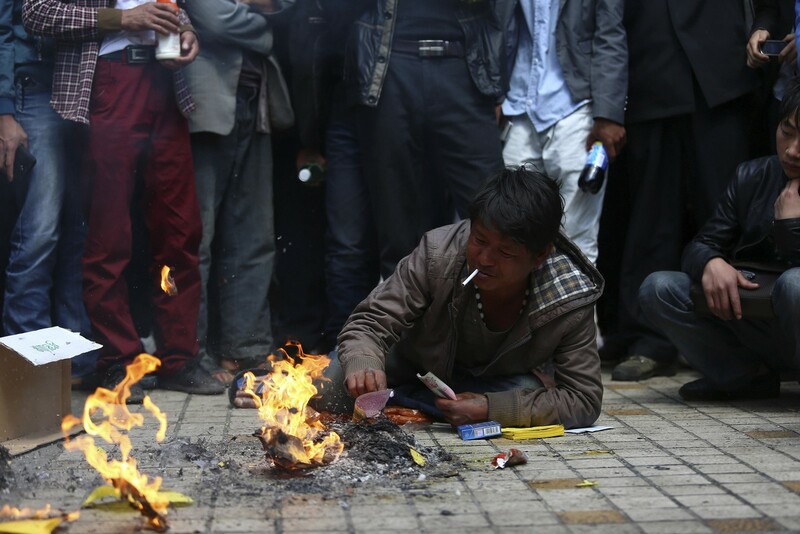 A man, whose relative was killed in a knife attack, lies on the floor as he burns offerings. 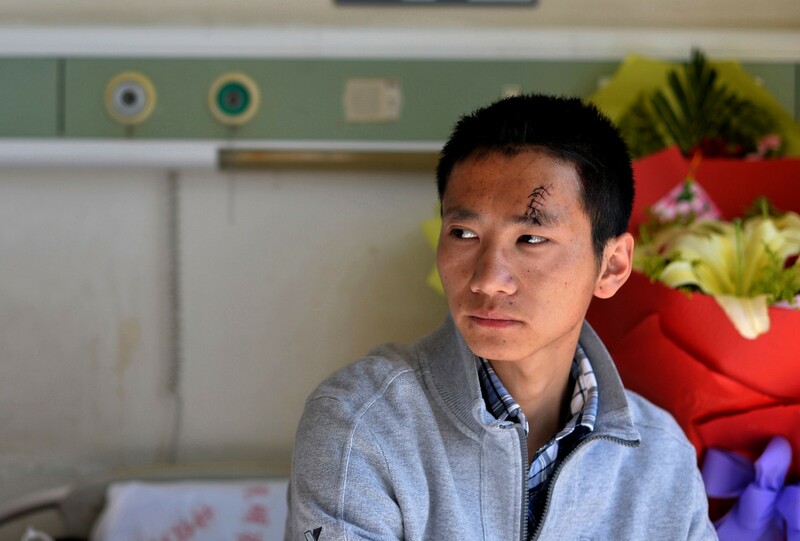 An injured victim sits on his hospital bed in Kunming No. 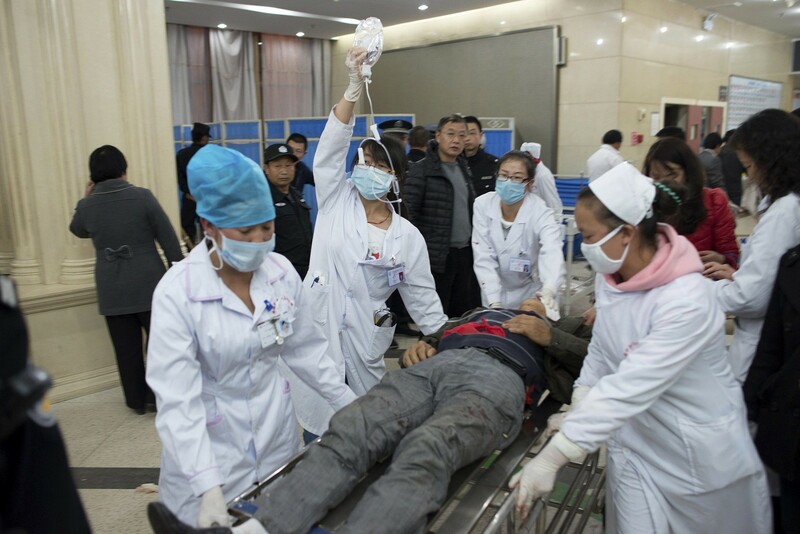 1 People's Hospital in Kunming. 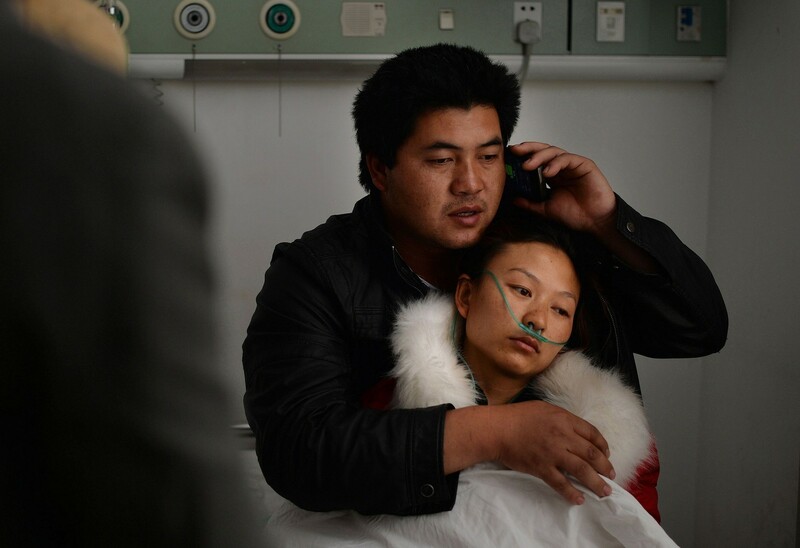 A woman (C) leans on a relative's shoulder after her husband was killed in a mass stabbing. 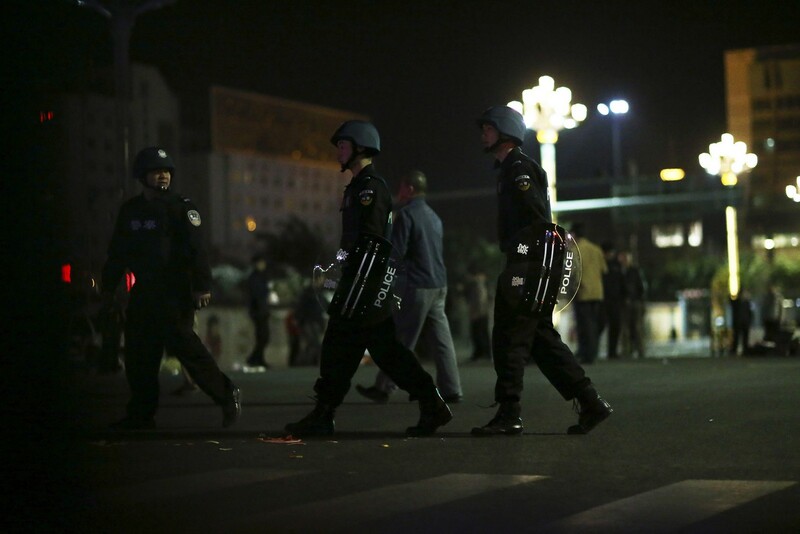 Chinese police and paramilitary patrol the streets after the attack at the main train station in Kunming. 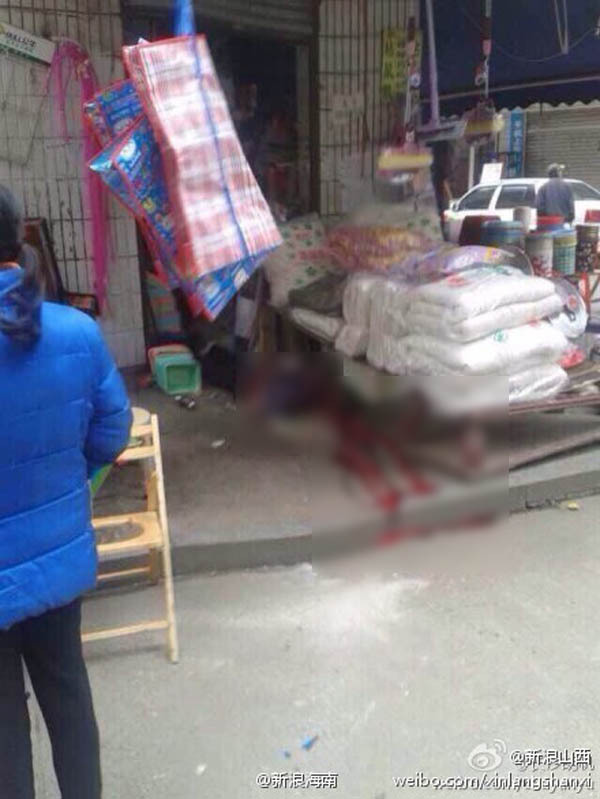 Attacks targeting civilians are rarer and almost unheard of in Yunnan province. 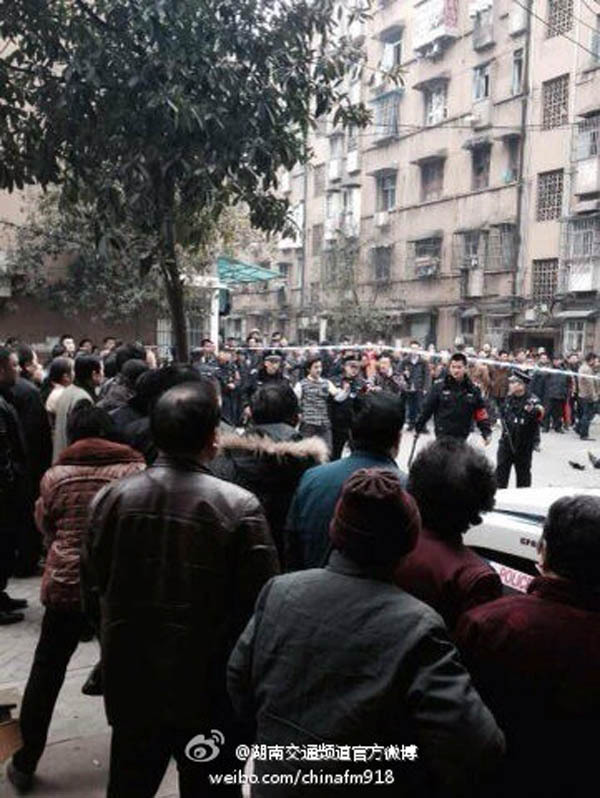 Relatives arrive at a funeral home to identify the body of a family member.